WHAT A DIFFERENCE A WEEK MAKES! BIG FISH CRASH! Weather– Could not have been nicer. Sunny skies and nice breezers. First week without crazy winds. Got hotter and more humid as the week went on. You could definitely feel it! Water – Getting warmer. Find the blue water you find the fish. About 80 degrees in some spots. Getting bluer and clearer. There was some big swell from the south for a day or two. Fishing – Best fishing of the season in terms of quality fish. 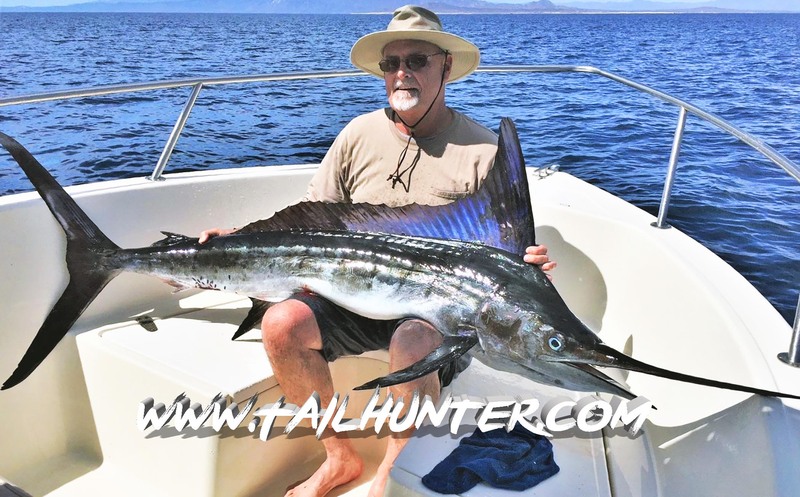 Lots of BIG fish…wahoo…tuna..marlin…sailfish…dorado. No roosterfish per se mostly because no one was chasing them! Not much inshore pargo or cabrilla either. They went for the bluewater species and trophy fish! Lots of BIGGER fish lost! Catching – Could have been better. We lost so many big fish! But that’s why these are BIGGER fish! They’re stronger and tougher on the anglers as well as the gear! Great stories of fish that were lost! Fishing got tougher later in the week as increased pressure on the fish plus a full moon seemed to lockjaw the fish. Much better earlier in the week. YEA! Now this is what we’re talking about! 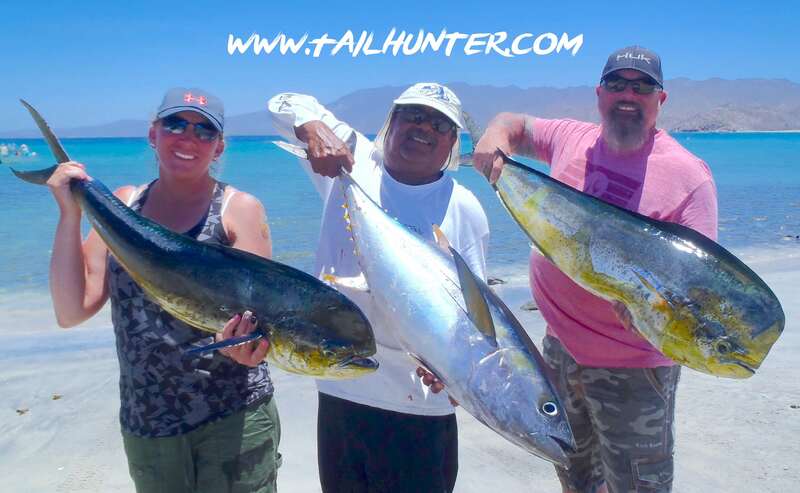 Captain Victor with Jennifer Robinette and Kenny Thompson from Utah with a great trio including tuna and to big dorado! Wahoo family! Captain Armando with Krista, Anthony and Anthony, Jr. of the Schmidt Family and some of the great wahoo this week! The family is from Lehigh, Utah. Two of the best amigos and two of the best anglers! Fat wahoo…look at this log! For Roger and Donna Thompson! It’s hard to get Captain Gerardo to smile, but he’s got double tuna for Steve Ritz and Larry Chastain! Whew! Haven’t seen dorado like this in awhile! 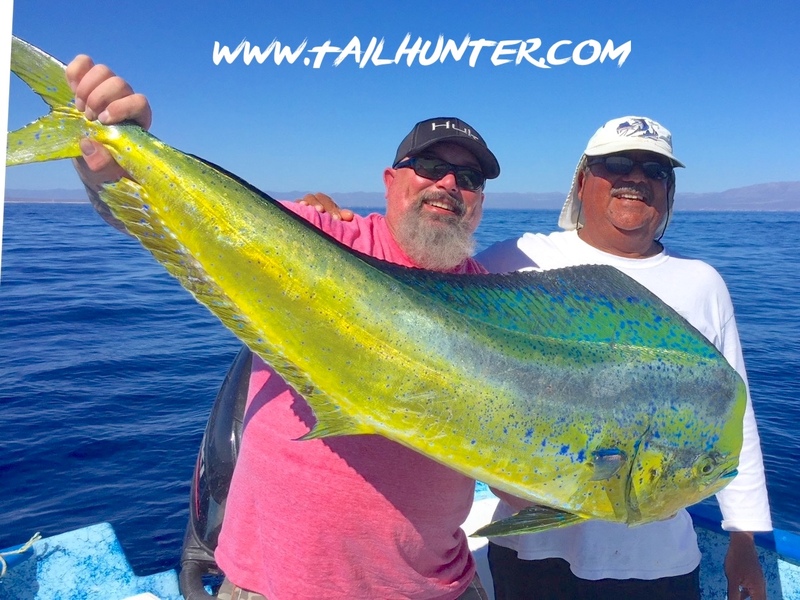 However, Kenny Thompson hikes up this pretty bull mahi with Captain Victor with all it’s great colors! Texas in the house! Larry Dodson with this gorgeous striper that ate a trolled Rapala and swallowed it deep so it couldn’t be released! However, the meat was donated around to La Ventana. 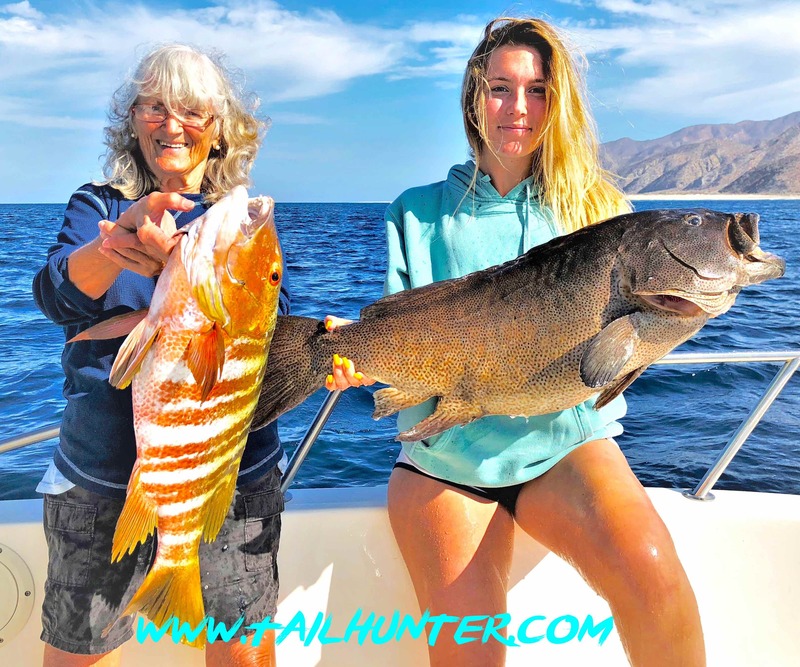 Taylor Murphy with a huge cabrilla and her grandma who’s no slouch either and a big time barred pargo! Check those colors! 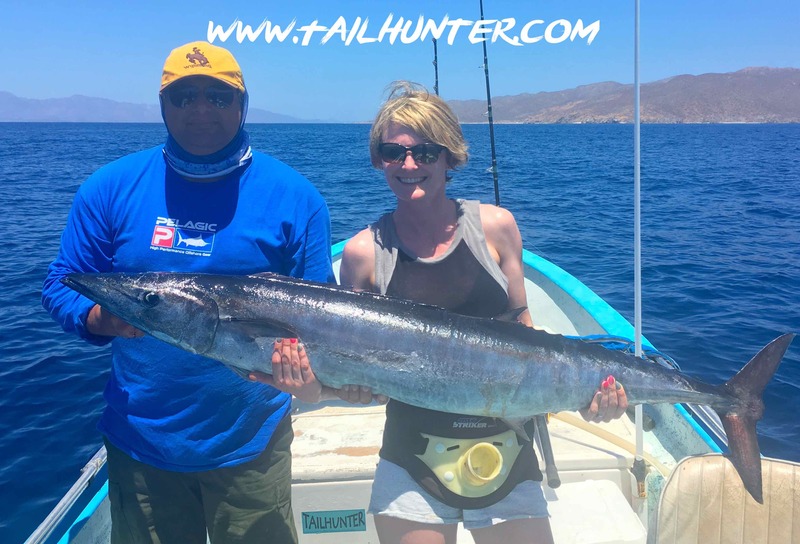 Pretty incredible catch with this big wahoo she handled by herself…Krista Schmidt from Utah with Captain Armando and an armful of speedy ‘hoo! Yup…there’s still some cold-water fish around! Hard to believe! 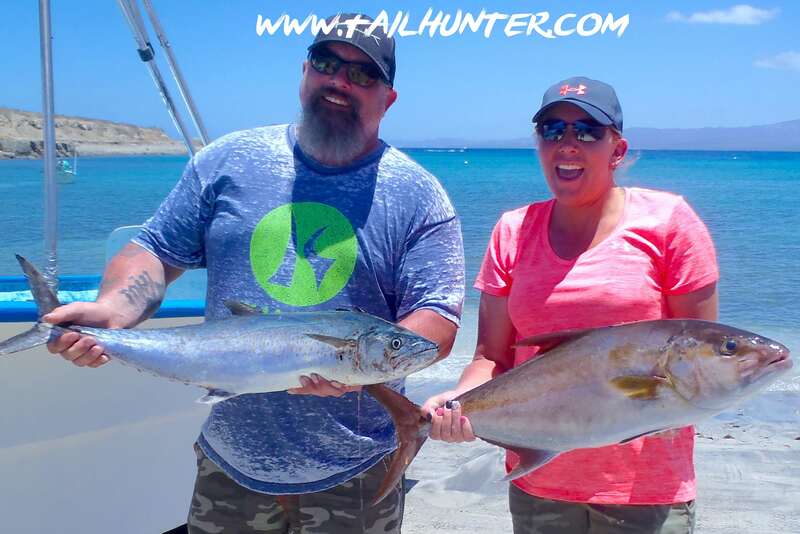 But Jennifer has herself an amberjack and Kenny has the biggest sierra I’ve seen all year! 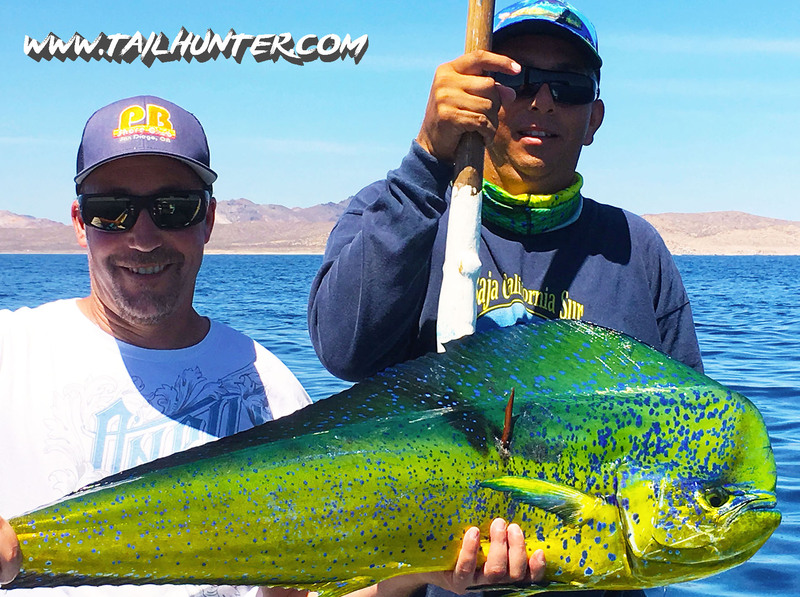 Great colors on this dorado caught by Jeff Correia from San Diego and gaff honors by Captain Joel. 1…2…3 LIFT! 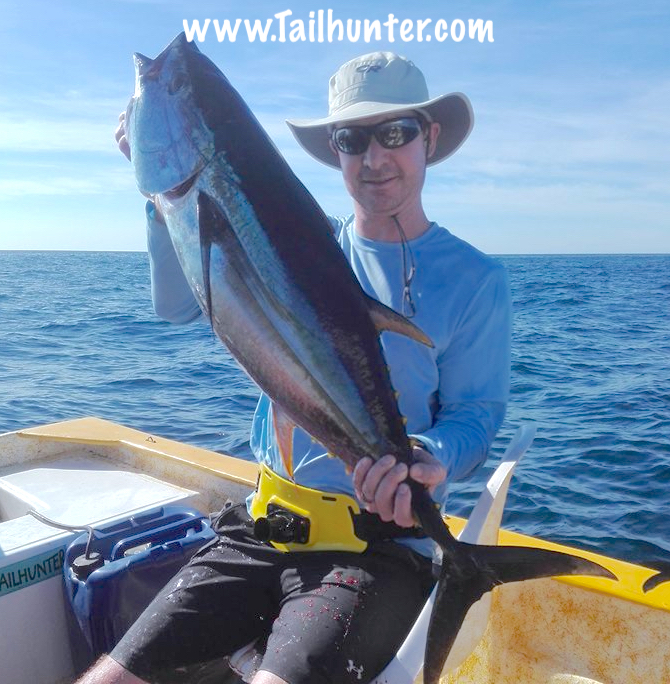 Roger Thompson fishing with Captain Hugo poses with a thick slugger yellowfin tuna! 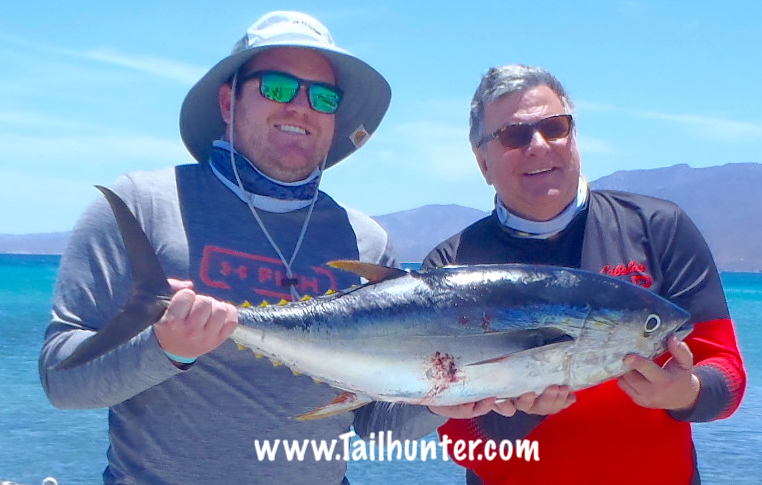 Another big smiles from Captain Gerardo and a legit yellowfin tuna for Steve Ritz and Larry Chastain! 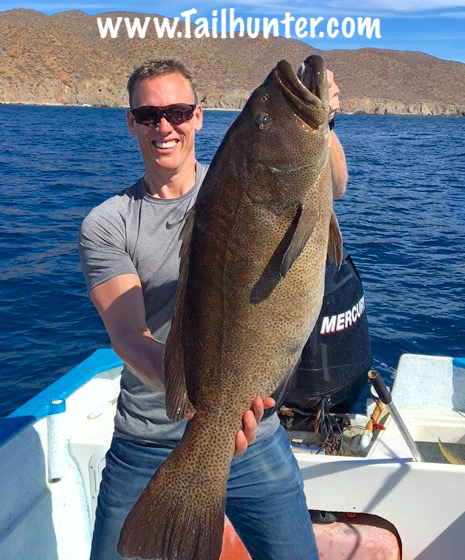 La Paz Bay yielded some nice dorado not too far out like this one for Tim Weaver of San Diego! Andale Captain Hugo! Hard to believe the size of some of the wahoo this week! Our Texas visitors really had a good week! No shortage of fish taken home to the lone star state! Tami put the hurt on this big ‘hoo. 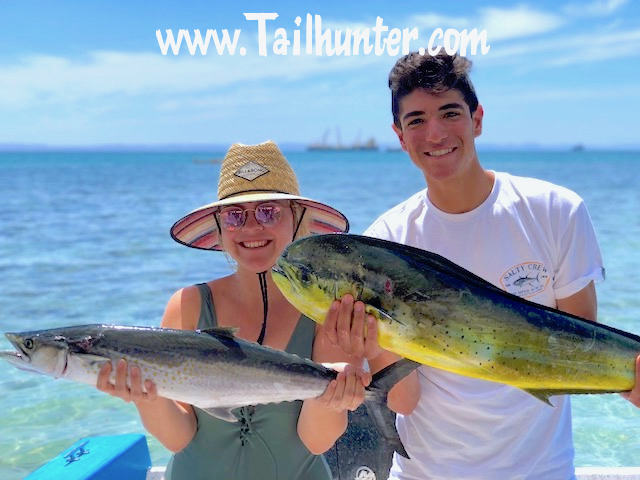 Captain Jorge from our Tailhunter Fleet lends and assist to Anthony Schmidt posing with another big wahoo and a good dorado as well as Jordan Schmidt. Oregon friends just had one day to visit us but managed to hang a nice wahoo at the end of the week when the bite was diminishing. This is Zeb and Katrina Jensen from Oregon. 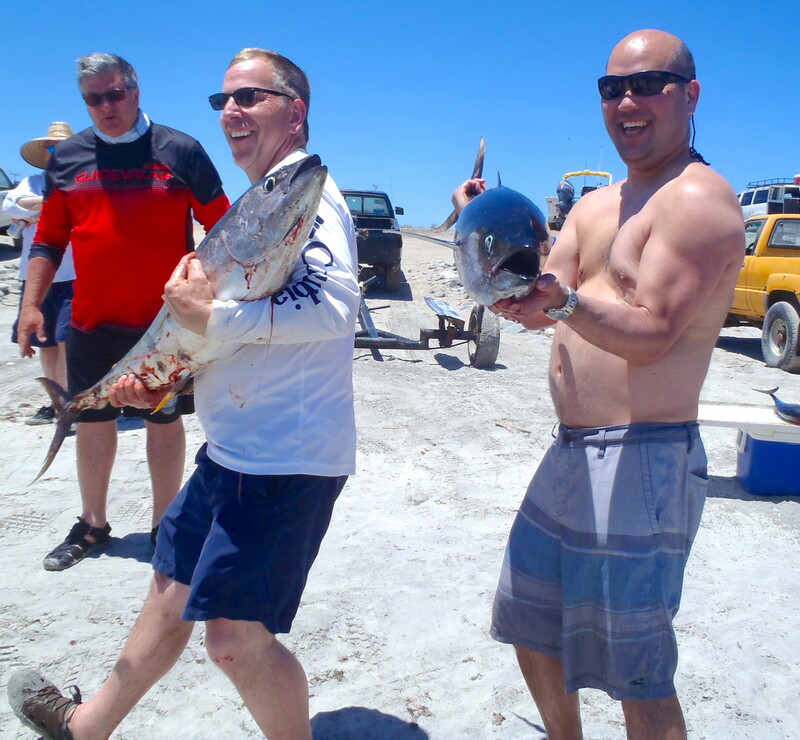 On the beach at Muertos, Captain Gerardo and Steve Ritz with some of that good-eating wahoo. Doubles! 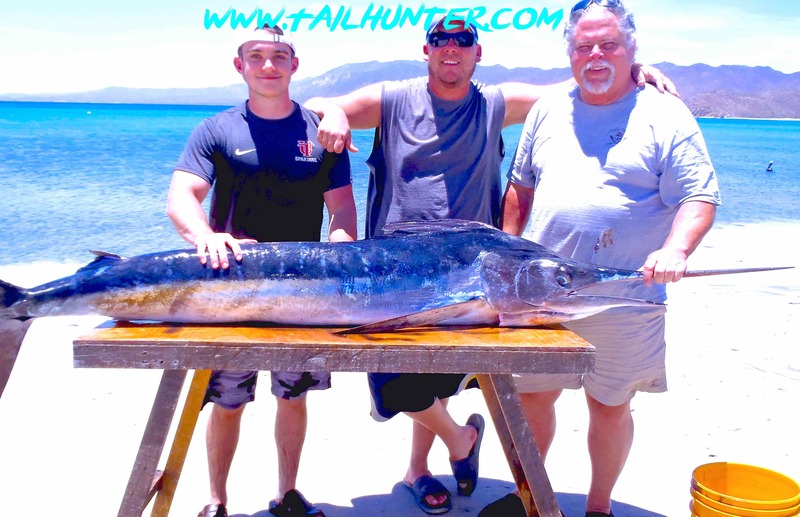 The Pantuso boys from Colorado hung this nice striped marlin. The fish could not be released but the meat was distributed. 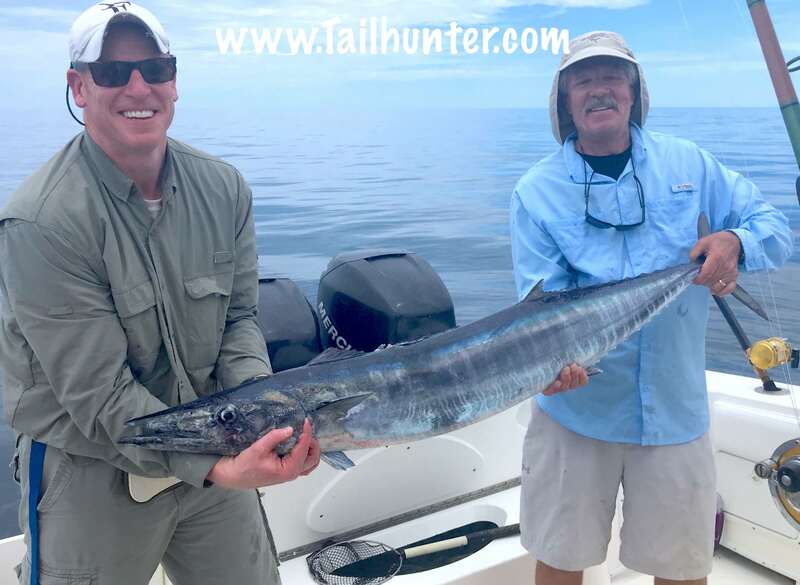 Early morning…nothing like starting out with a big wahoo for your fishing day! Another ‘hoo in the box! Al Dodson from Texas! As the week went on, fewer fish, but the tuna still hovered around. It was all home-run hitting this week. We had the best weather of the season and probably the best fishing of the season as well. Honestly, there weren’t many fish caught. And it got tougher as the week went on and more boats and fishing traffic hit the area as word got out. But the quality of the fish was outstanding, especially early in the week. 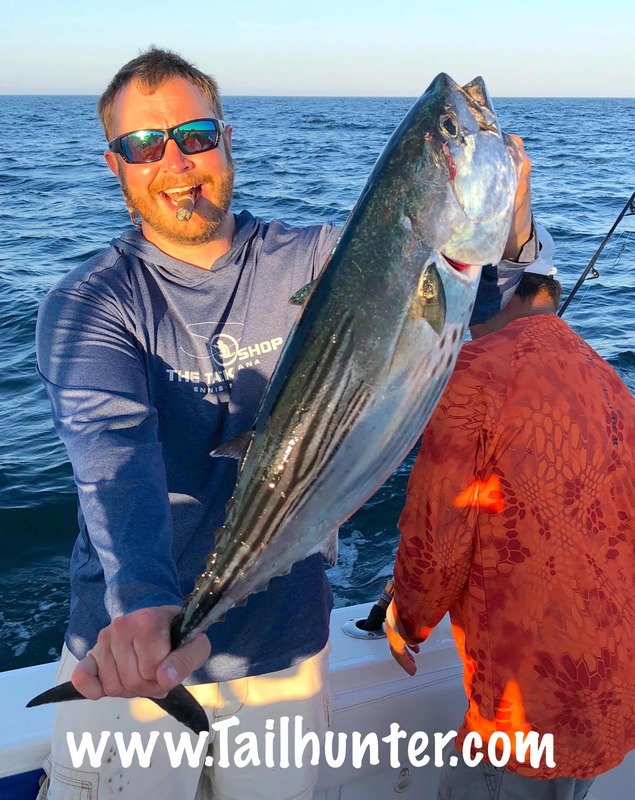 The anglers could have caught a lot more fish if they had opted to go small and fish inshore for all the cabrilla, jacks, pargo, bonito they wanted. However, as the week started, things blew up for our Las Arenas/ Muertos Bay Tailhunter Fleet. Nice fat 30-60 pound yellowfin tuna showed up. Wahoo in the 20-60 pound class blew up the rods. 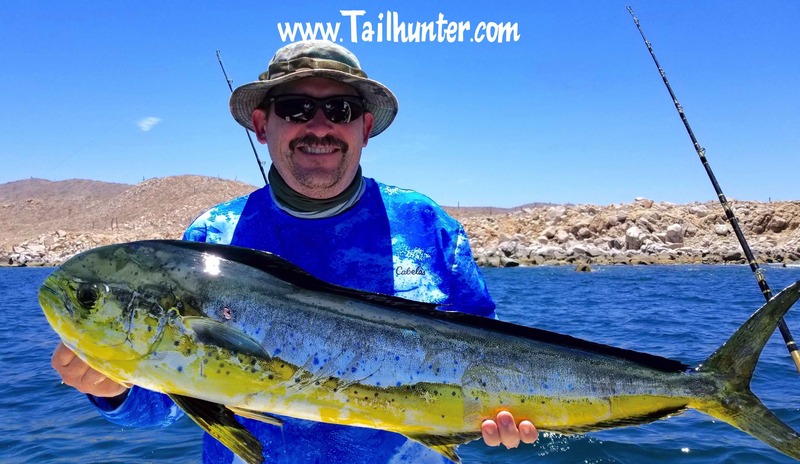 Dorado up to 40 pounds came crashing and even marlin and sailfish! So, when this happened, everyone came-a-running! It was swing-for-the-fences and hit a home run or nothing! But, folks got their largest fish ever or their first fish ever of this quality. Some folks got them and others didn’t. But, everyone wanted to take a shot. Also when you fight a fish for 45 minutes to an hour and it beats you up…for some, that was all they needed. For others who hooked up and had long battles…then lose the fish…just bad luck! That’s why these are bigger fish. It’s not bad fishing…it’s bad catching and we lost probably half the big fish that were hooked! Many of our anglers didn’t have that kind of experience on big fish or simple were over-powered or under-gunned in their gear! All part of the fun! It’s one thing to WANT a big fish and it’s completely different to actually HAVE a big fish on the line and you’re 10 minutes into the fight and realize the sun is blazing; your hands are already cramping; the line is stretched to breaking; the rod is completely doubled-over; and you’re sweating bullets! And the fish is STILL pulling line off the reel! As I said, some boats got into them and a boat right next to them would blank. Next day vise versa. But, al the fish were BIG! And as word got out, more and more boats came out and traffic on the spots increased. That scattered the bite and drove the fish down. So, the bite diminished a little bit each day although there were still some scattered fish. Also, the full moon came up with the weekend. However, for those who got into it, they caught fish of a lifetime! The season is ON! And many thanks going out to our Tailhunter Tribe members who have been bringing in donations for our Tailhunter charities! We have already distributed several hundred pounds of school supplies, clothes, shoes and other items! You’re the best. Thanks for Tom Ames from Idaho (who also donated to our scholarship program) and brought a big box of kids toys and gear; The Sawaske and Forestiere families who brought school supplies and Jim and Brenda Bovee from San Diego who hauled stuff this week. God bless you all! 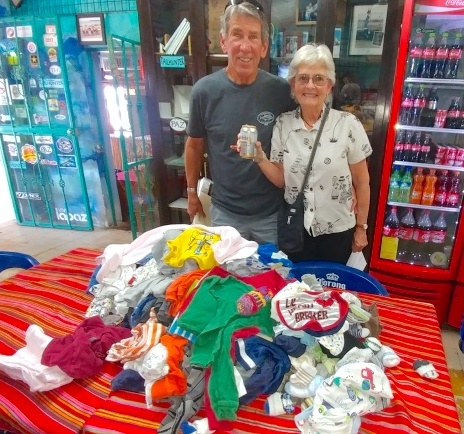 Jim and Brenda Bovee from the San Diego area came in with two ice-chests full of kid’s clothes! That’s our story and hope you had or are having a great Memorial Day Weekend! God bless all who gave…all who served…and their families! Weather – Best weather we’ve had of the season. Still some wind here and there and mornings are chilly and breezy, but the sun busts out later and it’s in the high 80’s most days. Nights are comfortable. Water – Water getting warmer but there’s still currents and some green and brown water around, but clearing up and getting better. Fishing – Still alot of variety with warm and cold water fish still mixed up and fishing changing daily and from place to place. Some days better than others. 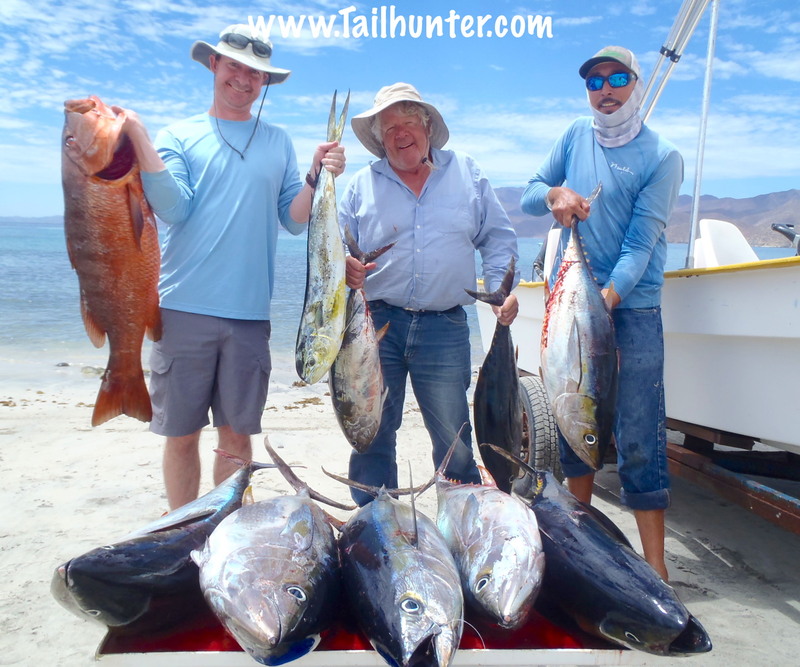 Catching – Some big tuna, roosterfish and dorado lost and the pargo and cabrilla took alot of folks into the rocks! Doctor Desmond Sjauwfoekloy from Los Angeles, is a heart specialist and literally ran out’ve surgery…jumped on a plane…fished a few days and jumped back on a plane and right back to the hospital. 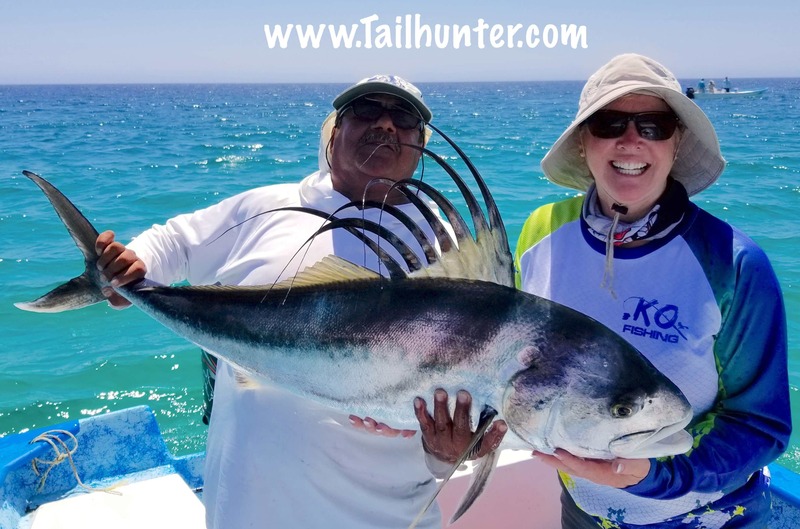 In the meantime, he put tuna, dorado and this slugger rooster fish in the panga fishing with Tailhunter Sportfishing in La Paz. The rooster was released. Captain Armando with a hefty 40-pound class yellowfin tuna that gave Jordan Schmidt quite a workout. Two other larger fish were lost! 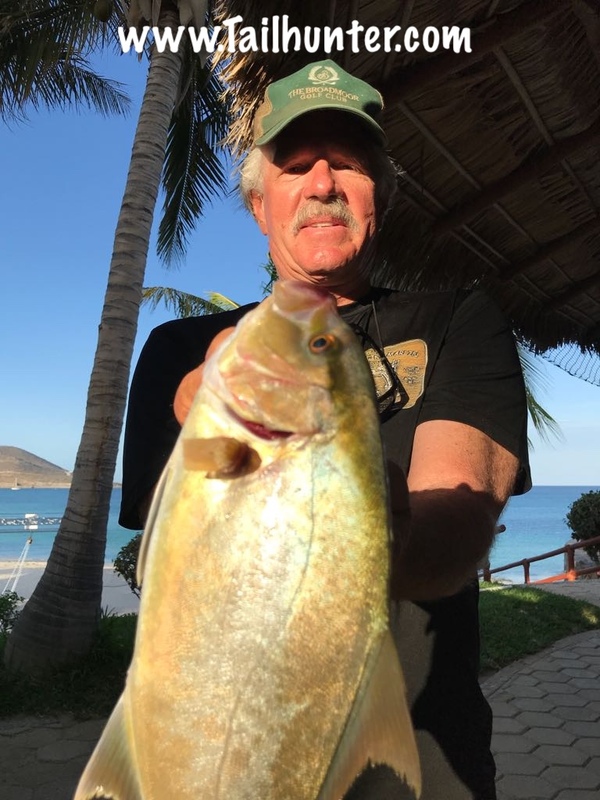 We normally don’t see quality dorado like this until a bit later in the year, but they’re already here just around the La Paz Bay. Nice pose by Blake Warren! Best week of the year, so far, for roosterfish. 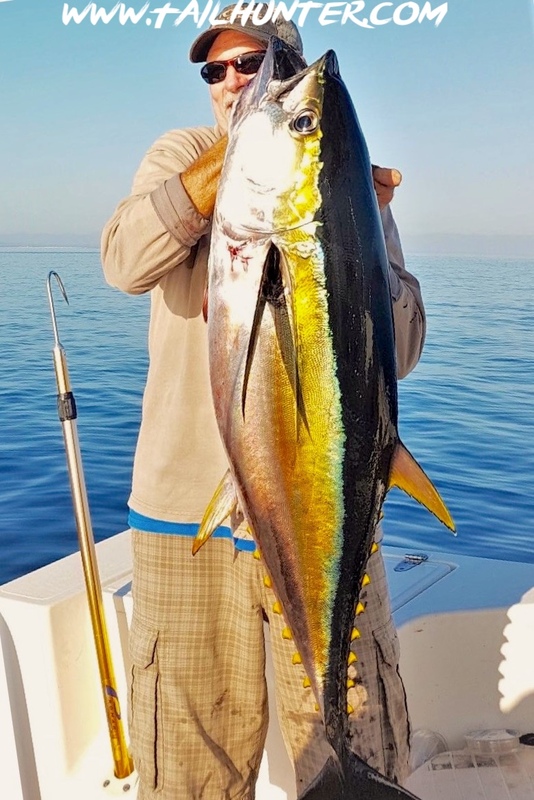 Nice fish for Josh Hobgood from San Clemente. 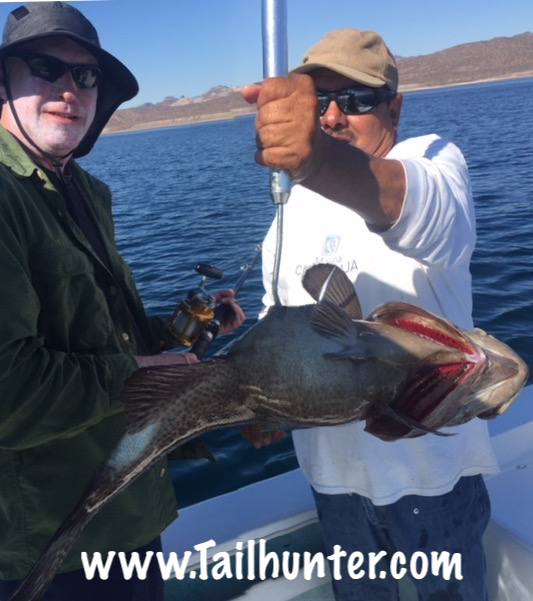 His first rooster ever and was fishing with the Tailhunter Fleet out’ve Bahia de los Muertos using live bait. The fish was released. I’m not sure the yellowfin have ever left since last year! They keep popping up just off the rocks in relatively shallow water like this one here caught by Desmond. Not sure what our Captain Victor has in the bottle…maybe salad dressing? Or marinade? Homemade maple syrup? But Randy Choate, our Idaho amigo has himself a nice bull dorado. 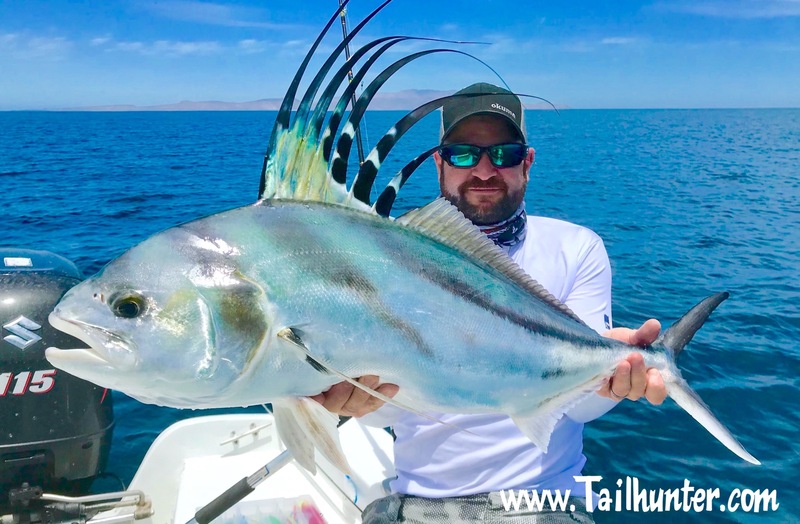 Western Outdoor News Editor Blake Warren from Capistrano Beach CA came down from some RNR vacation time in La Paz and got his biggest rooster fishing with the Tailhunter Fleet using a live lady fish for bait. The fish was released. As pretty a picture as you’ll see of a fully-lit dorado with great colors! Gorgeous fish for Desmond just off Espirito Santo Island. That’s a fun day of action fishing and a great expression and pose to go with it! Blake Warren has himself a mess of snapper, pargo and seabass headed home to Orange Co. Conditions are improving with every week, but we’re still getting some jags of winds and off-color water as we move into warmer conditions. However, overall, it was maybe the best weather of the season with mostly great sunny days and generally flat seas. It wasn’t a great week of fishing, but wasn’t bad either. As we transition into more pelagic warm-water species, there’s a lot of variety in the water. 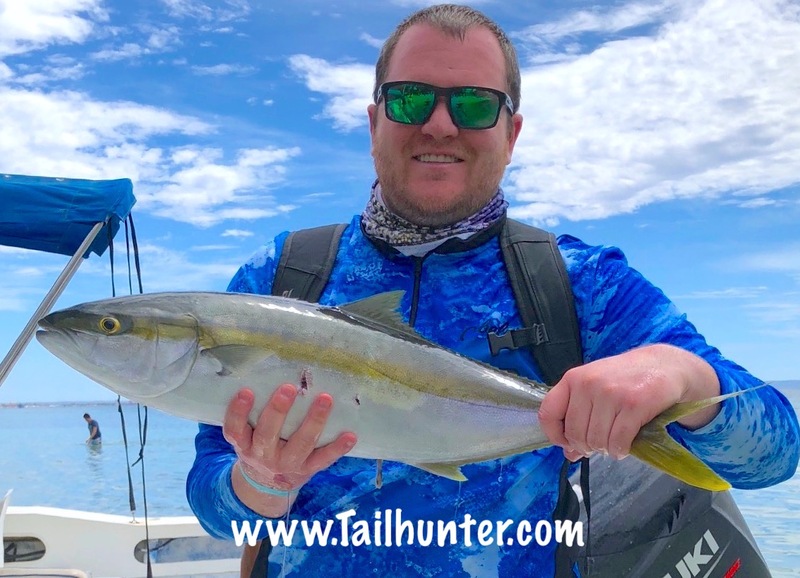 Cooler water species like yellowtail and amberjack seem to still be lingering around and we got some up to about 20 pounds. 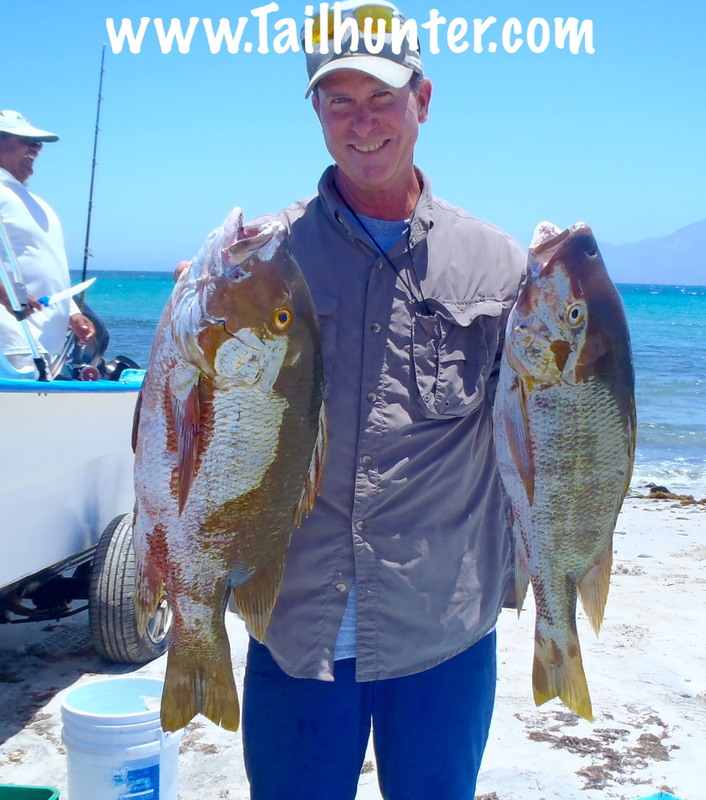 Other cooler-water species like pargo, snapper and cabrilla also made for some great action. However, the presence of more species like tuna, wahoo, dorado and billfish are evident of the changing conditions. There’s not a lot of blue water stuff yet, but we’re getting a few here and there and seemingly more with each passing week. Also more big-time rooster fish are showing up as well in the 40-60 pound class. The biggest issues is that fish are everywhere! But the problem is that they are not everywhere ALL THE TIME! Conditions can be so erratic that what’s biting one day doesn’t necessarily mean they will bite the next day. Or, one fishing hot spot can suddenly go cold as fast as the currents change and the water colors change. 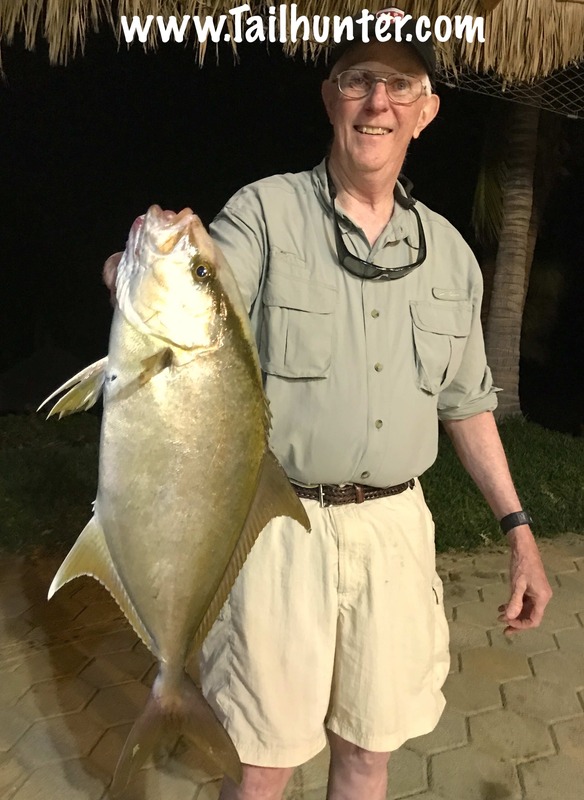 Or, a spot that’s great for pargo, will turn into a jack crevalle spot the next day or conversely one of our boats will be bent on fish while a boat a few yards away can’t get a single chew! It’s ever-changing and changing daily and hourly! Weather – Chilly windy mornings give way to beautiful sunny days. Day time temps mid-80’s. Still too much wind for my liking but it’s less every week. Fishing – Not bad. Could be better. Some days a struggle or one boat does well and boat next to it has to pick at it. 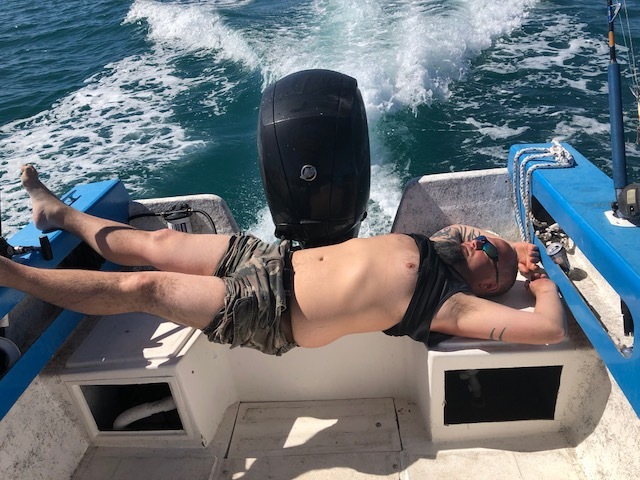 Lots of variety, however…tuna, dorado, wahoo, roosterfish (finally), dog-tooth snapper, pargo liso, pargo mulatto, cabrilla, triggerfish, bonito, skipjack, jack crevalle, amberjack, sierra, yellowtail and yellow snapper all caught this week. Catching – Wish we didn’t lose so many large fish! But, I guess that’s why they are larger than their friends! Our first “official” roosterfish of the season! (No one has really been asking to fish them so far until this week!). But Diane Kosnosky from Arlington WA with Captain Victor picked up this 40-pound class rooster on the line then released it! They also lost two others! 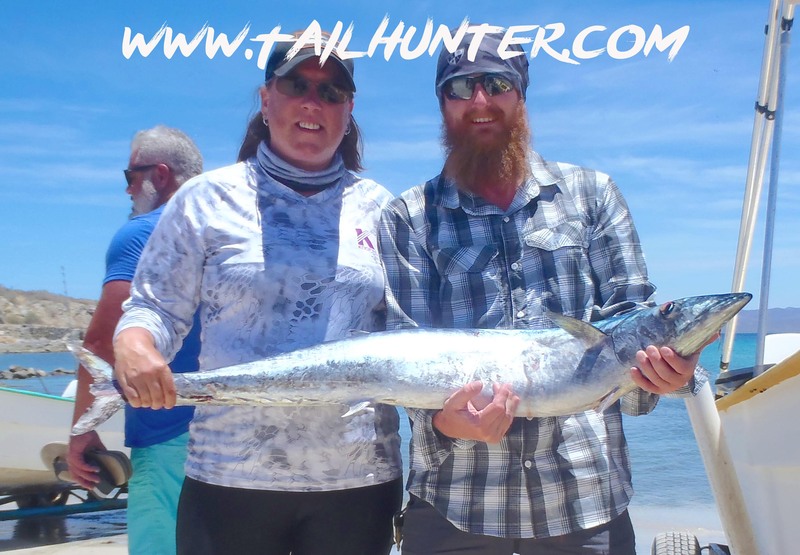 First official “wahoo” of the season too! (We’ve had others on, but the toothy critters have bit off!). 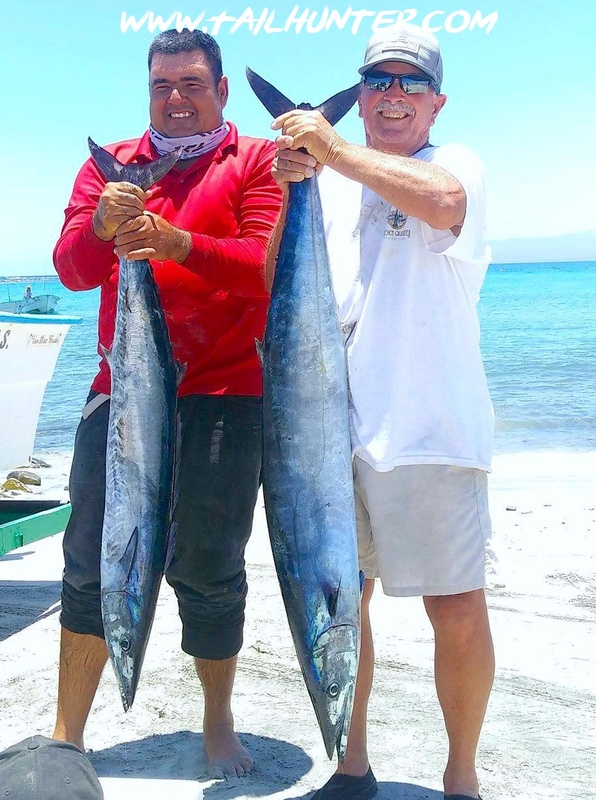 Jerry Siegal from Colorado Springs our our amigo “Goyo” Wagner owner of the Rancho Costa Resort in Muertos with a speedster wahoo! If he looks familiar, no, it’s not Captain Pancho! It’s his brother, Miguel. Early in the week when the tuna were foaming he was with Doctor Ernesto and Santiago harvesting some “meat” for the freezer. The tuna tapered as the week went on. The “right kind” for Bill Johnson of Colorado with a trophy cabrilla going into the freezer. So great to be getting quality dorado so early in the season like this beauty caught by Dave Kosnosky from Washington not far off the rocks! Is there another doctor in the house? 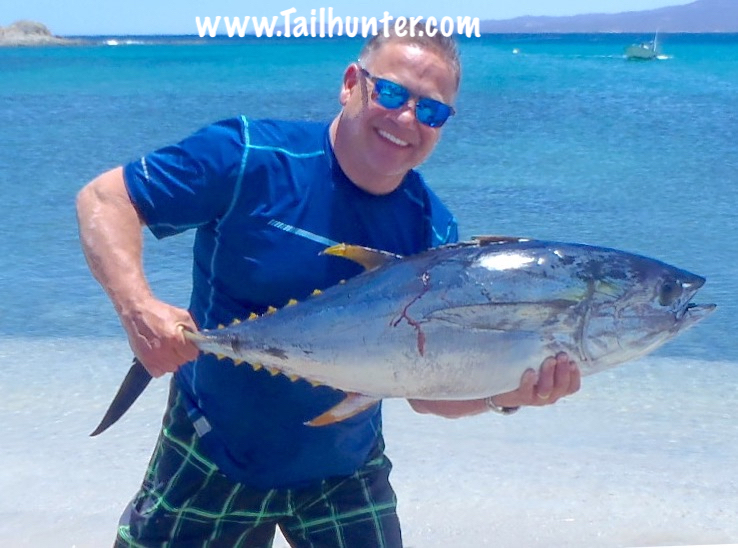 Doc Gianni Checa from Denver area was one of the funnest guys of the week and holds up another yellowfin tuna on the beach at Muertos Bay. 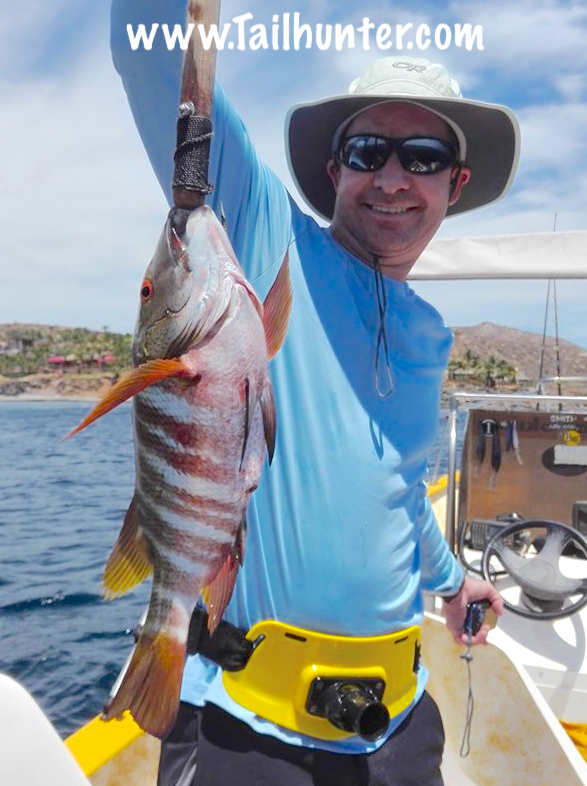 Arizona team of Rob and son, Craig Hoffman rapped this gorgeous dog-tooth snapper out’ve the rocks near Punta Perrico. 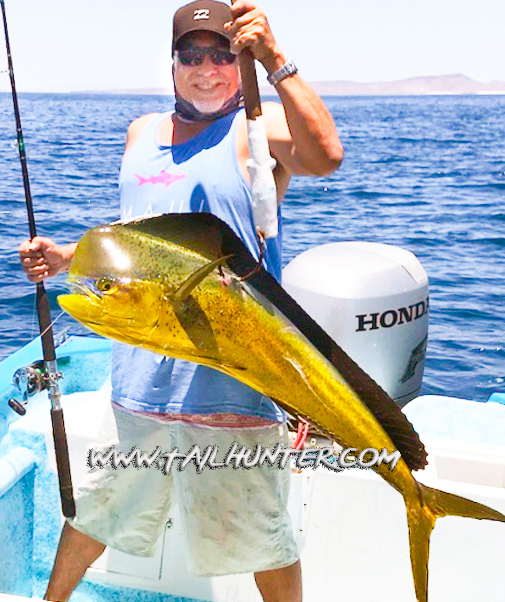 Captain Luis on the gaff work for Diane Kosnosky just north of La Paz and her bull dorado! Quality yellowfin tuna for yet another doctor this week! 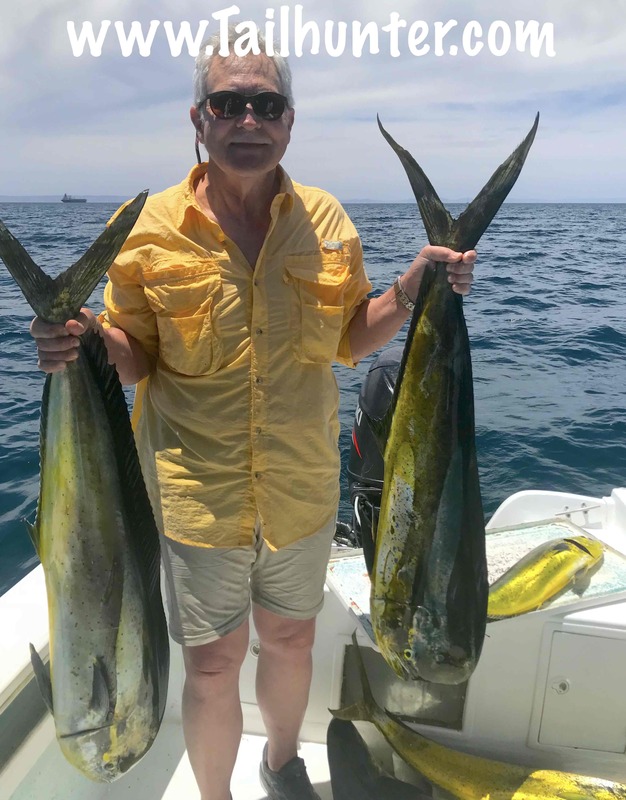 Dr. Roy Stringfellow poses with his catch just off the south end of Cerralvo Island where the tuna boiled for a few days! First-day double fisted pargo for George Talbott from Rio Vista CA on the north end of San Francisco Bay. Great eating fish and super fighters! 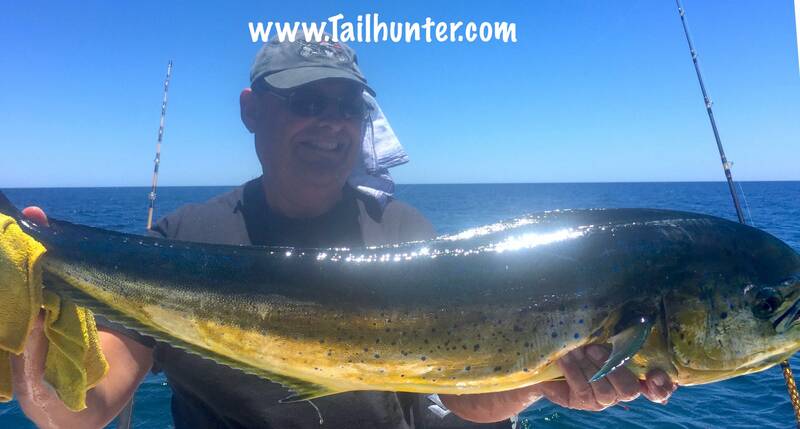 Dave Johnson from Denver showing off one of his good-looking mahi that he caught on one of his days fishing from La Paz around Espirito Santo Island. Slugger tuna early in the week when they were rocking just outside of Muertos Bay, Punta Arenas and the south end of Cerralvo Island. 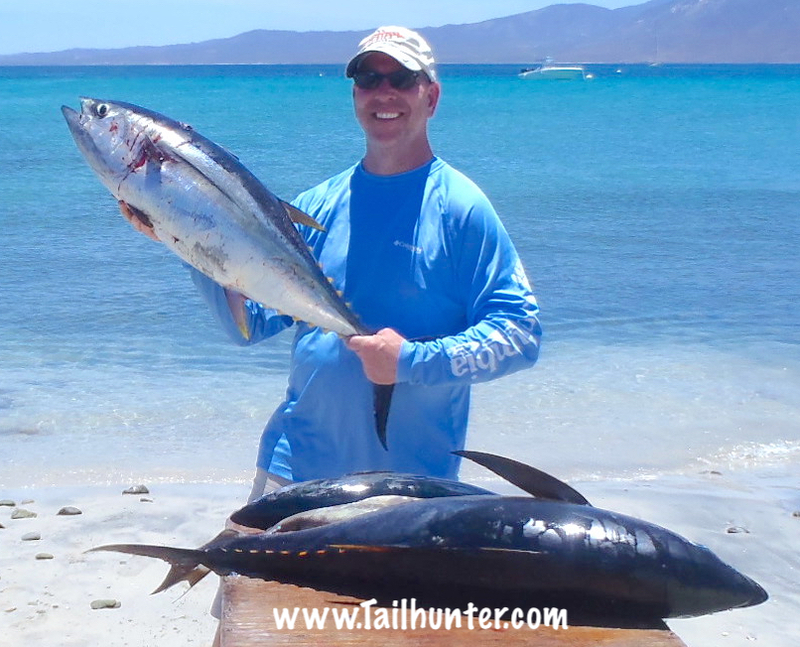 Craig Hoffman from Arizona got his first tuna ever…and then a few more! I know it’s the upside down belly photo of the fish, but it’s really a dandy cabrilla held up by Captain Boli caught by Joe Vondrak from Portland. 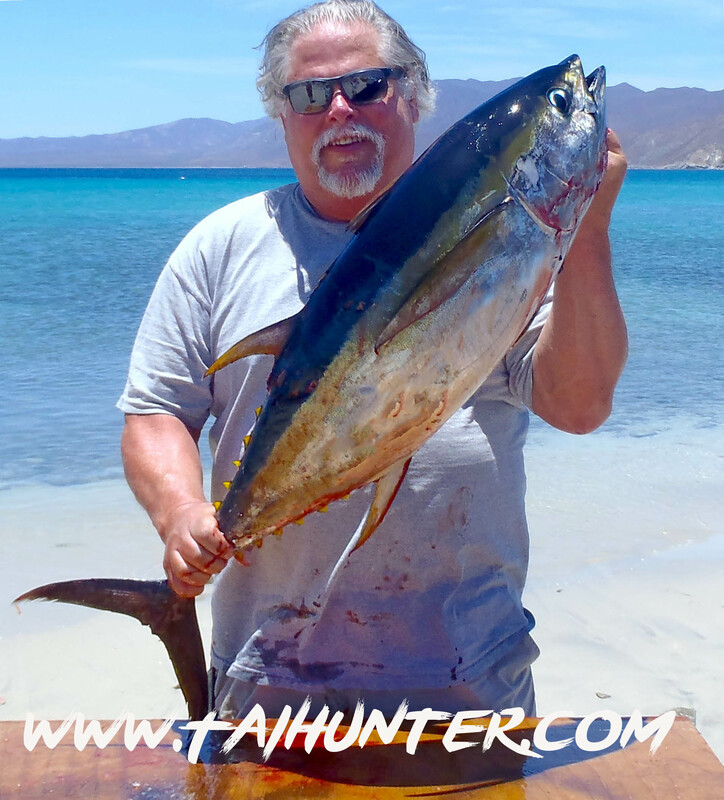 Our amigo, Gary Wagner on the beach in front of Rancho Costa in Muertos Bay with a tuna no double headed for dinner at the resort. This might be the last yellowtail of the season. A little guy but still tasty. 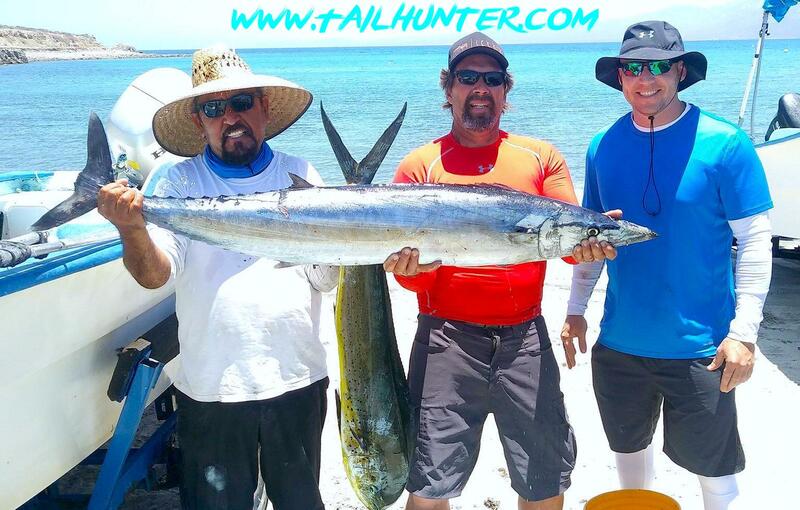 Waters are now getting too warm for many more yellowtail which are cooler-water fish. Dave Johnson does the honors. 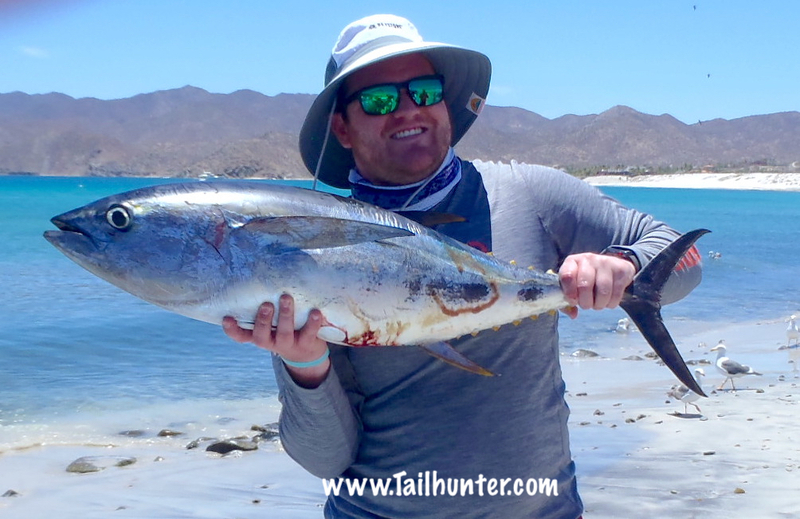 Fat bonito provided action all week for many of our anglers and are bulldogs on a rod and reel! Tim Cherwin from Montana shows how big they are right now. Another of our Oregon amigos, Mike Lohrey, had a pretty nice day on the water judging from this photo of all his dorado. He was fishing just outside of La Paz Bay. Parting shot! Too funny guys…Mark Bigalk and Gianni Checa…goofing for the camera with some tuna. Not a great week but not a bad week either. We’re in that transition time between cooler waters moving out and warmer waters moving in. Add in the variable winds that can still be ver strong and erratic and there’s a lot of currents pushing water temperatures, conditions and the fish around. Quite frankly, you’re just never sure what you’re going to catch right now as it varies from day-to-day and even from boat-to-boat next to each other. One day waters are blue and the next day or even the next hour in the exact same spot, the waters are turned over and coffee colored and you have to find a different spot. 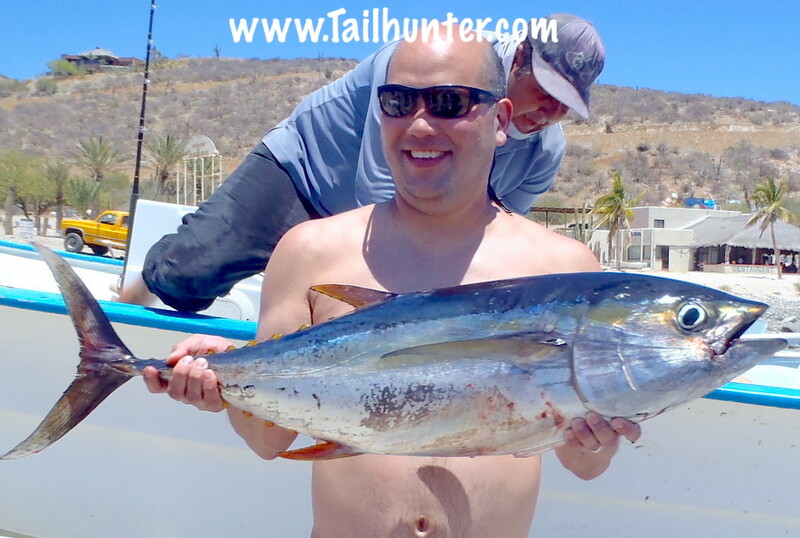 One day that only has picky fishing for bottom fish suddenly turns into a tuna or dorado hot spot the next day. For sure, if you’re looking for variety, this is time of year. 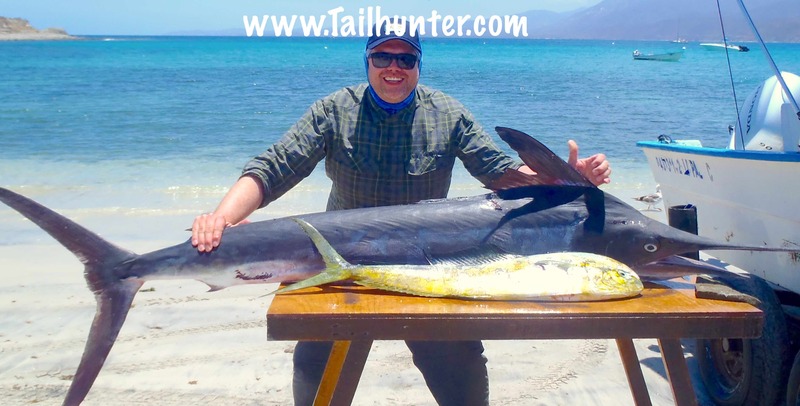 For example for our Tailhunter Fleet from Las Arenas/ Muertos Bay, we had a nice jag of 20-40 pound yellowfin tuna early in the week just off Punta Perico, Punta Arenas and the south end of Cerralvo Island very close to shore and in relatively shallow water. The bite tapered as the week went on (but also probably had a lot to do with the fact that live sardines were difficult to find). 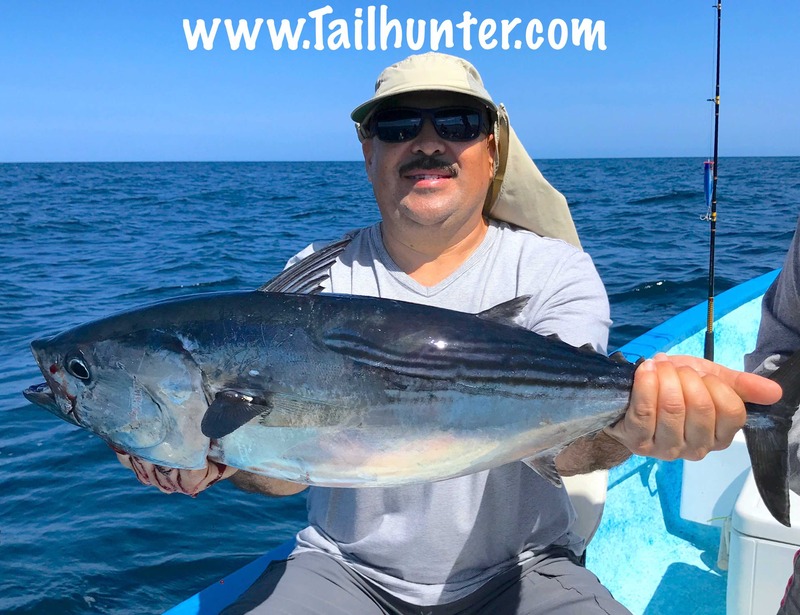 But, then inshore species like big cabrilla (especially at the north end of the island), pargo mulatto, barred pargo, sierra, amberjack, bonito and others filled the gap. Not a lot of fish, but enough to keep things interesting. We saw more billfish in the area, but not really willing to bite just yet. But good news with our first rooster fish (30-50 pounders) and wahoo finally getting into the count. 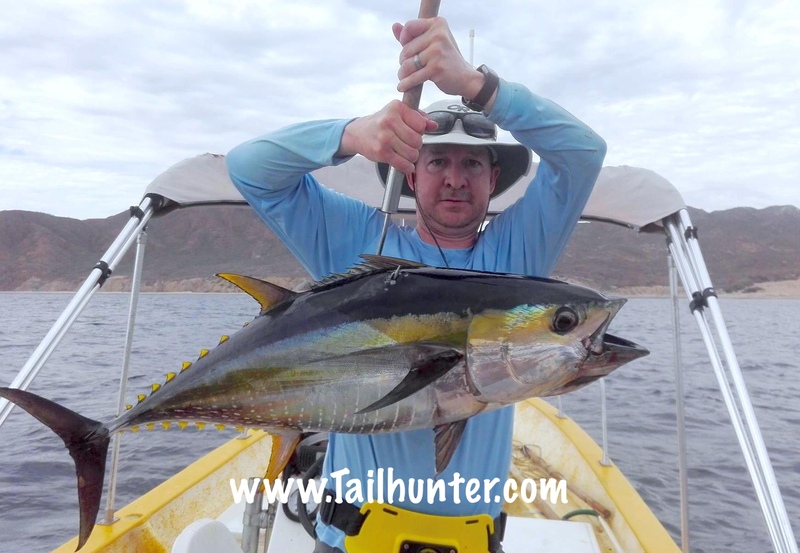 For our Tailhunter La Paz Fleet, the bite was more consistent, especially around Espirito Santo Island. 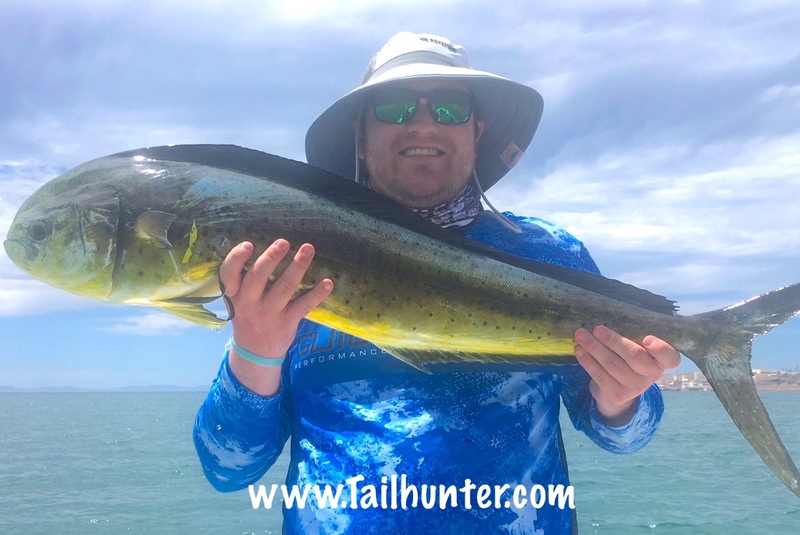 We didn’t get a lot and some days were better than others, but some surprisingly legit-sized dorado running 15-25 pounds caught on live bait and dead stripped bonito. Some of the fish were taken in water so shallow you could see the bottom! The same areas also kicked out some hefty bonito, pargo, snapper, cabrilla and a few left-over yellowtail as well which will probably be the last of the season. TUNA and BIG DORADO SAVE THE WEEK! Water – Pretty blue and warming up. So why are we still getting cold water fish like sierra and yellowtail? Fishing – Most of the week, it was sticky. Decent action, but nothing too special. Got way better late in the week. Way mo’ bettah! Catching – See “Fishing above.” But, with bigger fish, catching got a little harder…BIGGER fish are tougher fish. Some of our anglers got “played” and toyed with by the big fish! LOL . But if the fishing wasn’t good, there could be no “catching, ” right? Wow! Now THIS is a good day of fishing! Captain Pancho hooked up Craig and his dad, Robert Hoffman with 8 yellowfin tuna, a dorado and a big dog-tooth snapper near Las Arenas! Traci Weaver is an accomplished flyfisher from Oregon, but when big winds and waves made it tough, she grabbed a conventional rod for the first time. 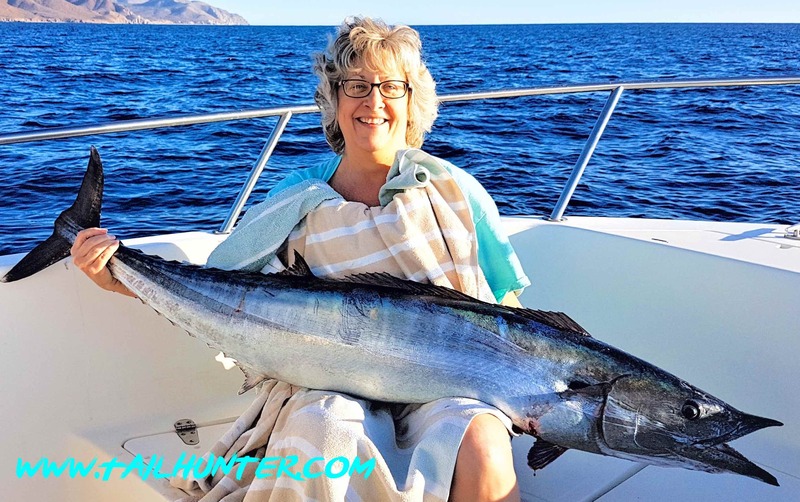 She said, “I didn’t even know which side was up and the handle seemed to be on the wrong side!” However, her first biter turned into a trophy dog-tooth snapper just off the rocks at Punta Perrico near Las Arenas with Captain Moncho of the Tailhunter Fleet. Colorado in the house! 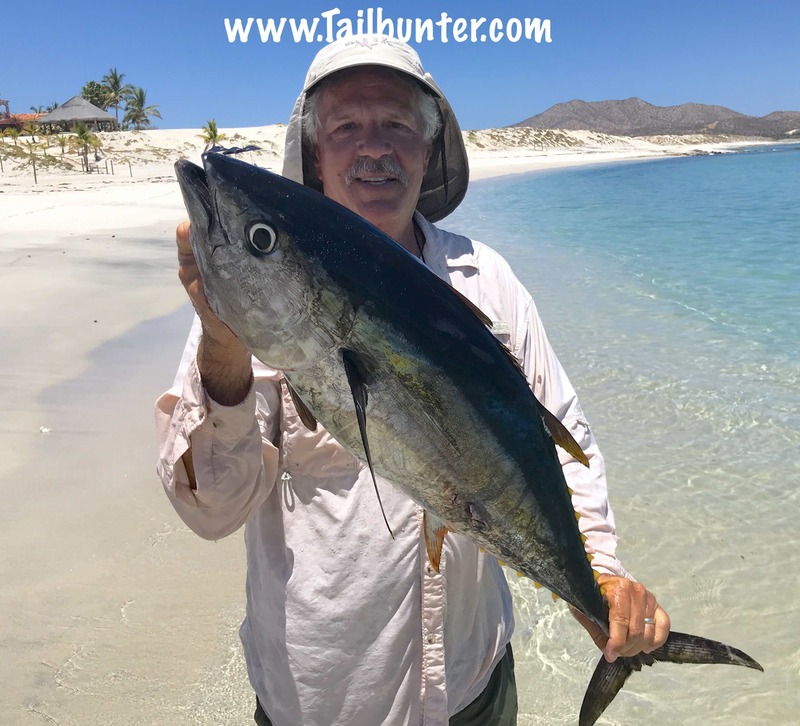 Ed Eversol with his first tuna and a great pose on the beach at Bahia Muertos. Chunky yellowfin! 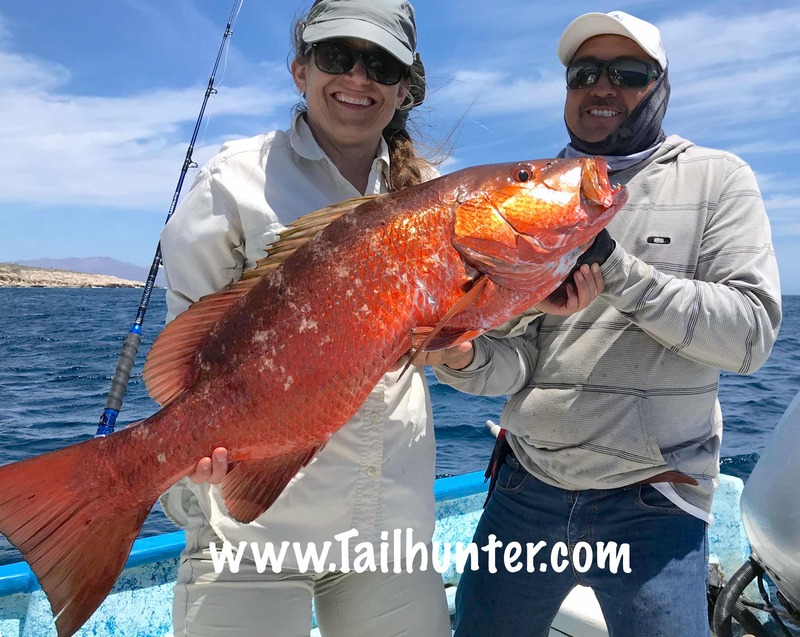 From San Diego, Rebecca Coxsey fished in La Paz for the first time with Tailhunter Sportfishing and got her first dorado and had fun with lots of bonito and pargo as well. She thought it was pretty funny that the dorado matched her bikini. 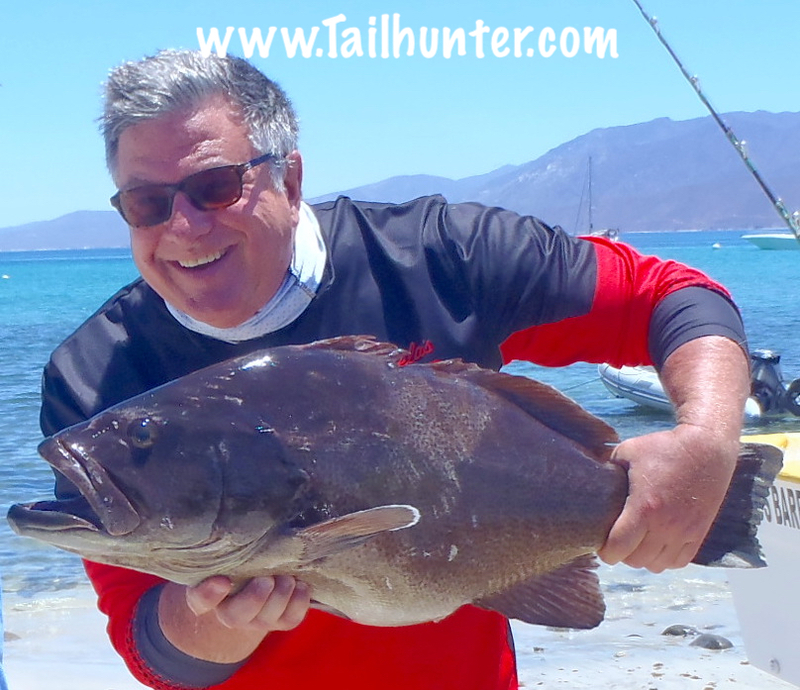 The fish was caught just outside of Bahia de los Muertos. 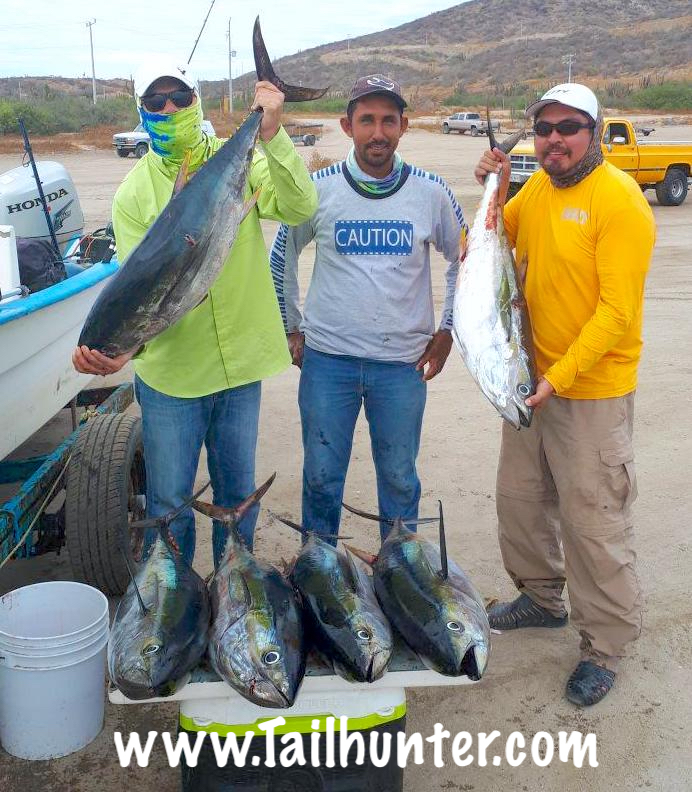 It started this week a nice smattering of yellowfin at Muertos Bay…that got better. 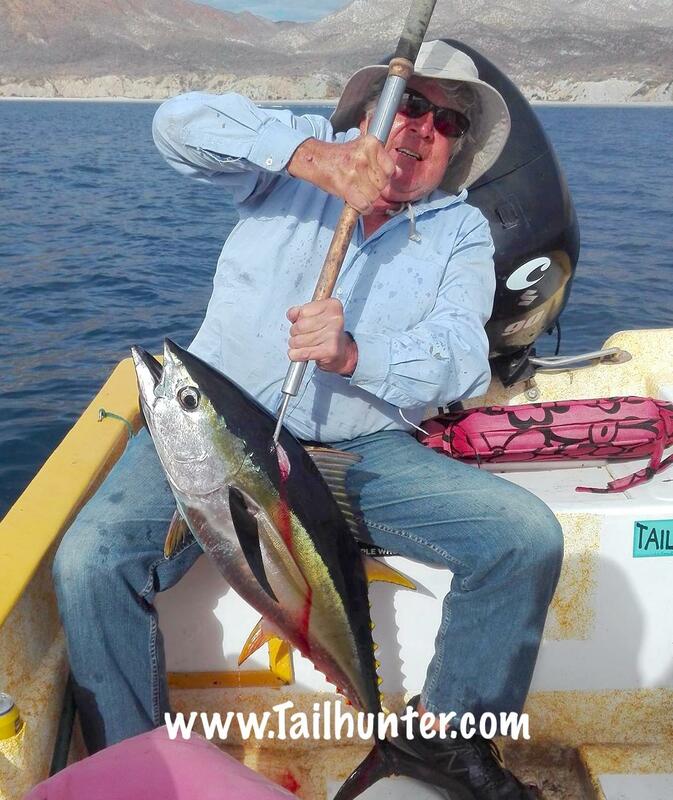 Dave Hill is from Grand Junction CO with this tuna. Popular Captain Gerardo with Dr. Gianna Checa and some of their yellowfin tuna plus a few other assorted fish on the cutting table! 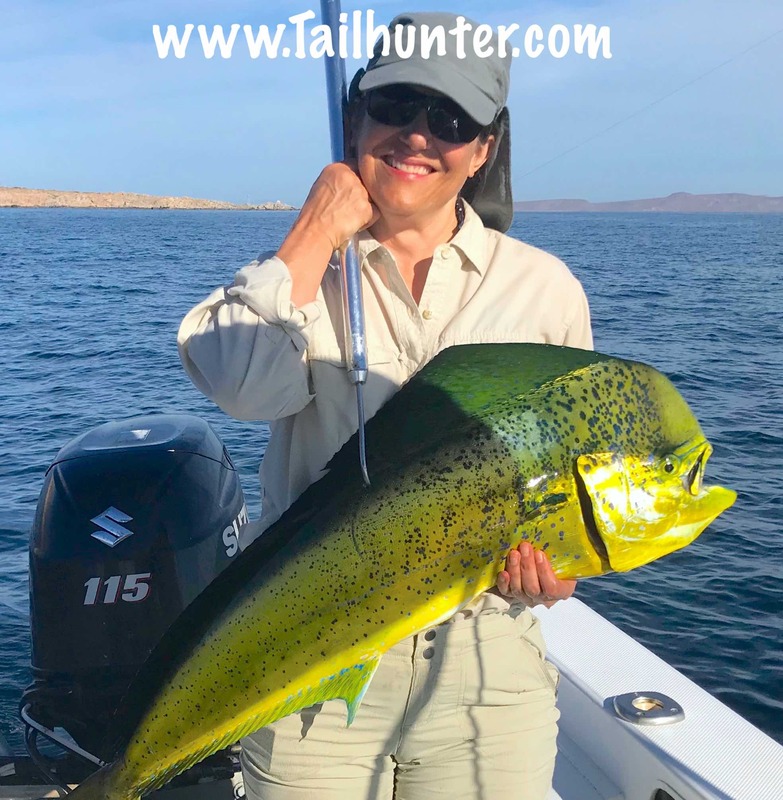 Pretty smile for Traci Weaver and the nice dorado she caught off Espirito Santo Island north of La Paz. His first tuna…finally! 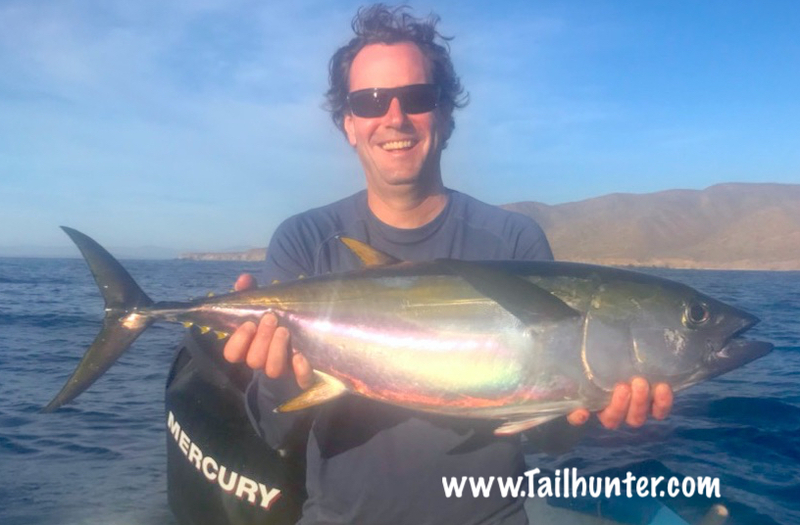 Craig Hoffman visited us from Arizona and was able to spank this tough yellowfin tuna just outside Bahia de los Muertos near Las Arenas. Dave and Bill Johnson share some photo time with Bill’s tuna! Big bull for a big fella! 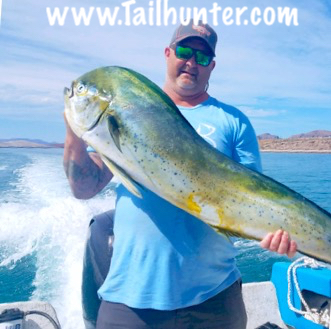 Jason Robbins from Washington put the wood to this bull dorado fishing with our Tailhunter Fleet out’ve La Paz near Espirito Santo Island north of town. Trophy grouper in the boat! Don’t see many of these, not because they’re not around, but getting them out’ve the rocks is quite a task. Marc Garrison from Chicago staying there in Muertos at Rancho Costa. 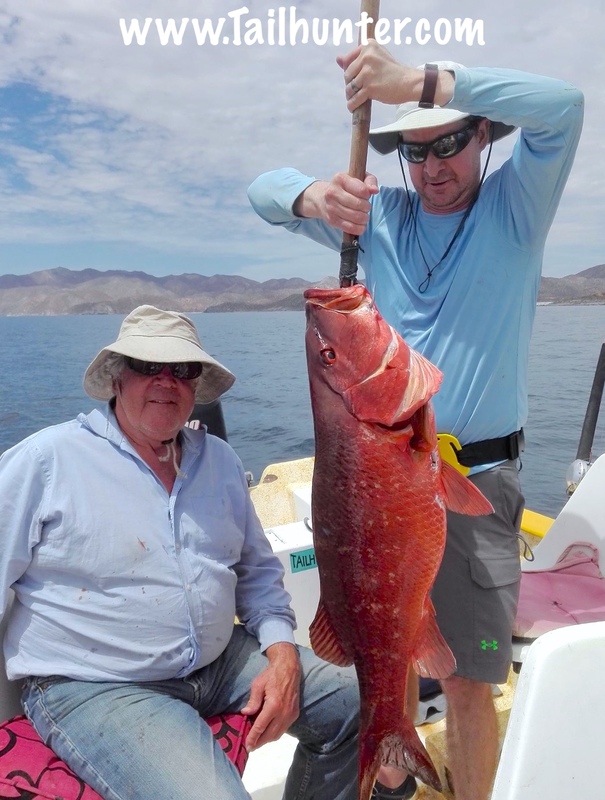 We don’t often have Captain Boli of our Tailunter La Paz fleet, but he’s got a big sonrie going on here with Mike Lohrey from Portland OR and one of several sizeable dorado he caught. Another of our first-timers this week who rocked it! Louis Agassiz from Canada was in town for a wedding and only had limited time to fish. He had never fished in warm water before, but his first fish turned out to be our first marlin of the season. He also got this nice dorado! The marlin could not be released but the meat was shared. A load of fish headed to the Tailhunter Restaurant for sashime and Hawaiian poke! 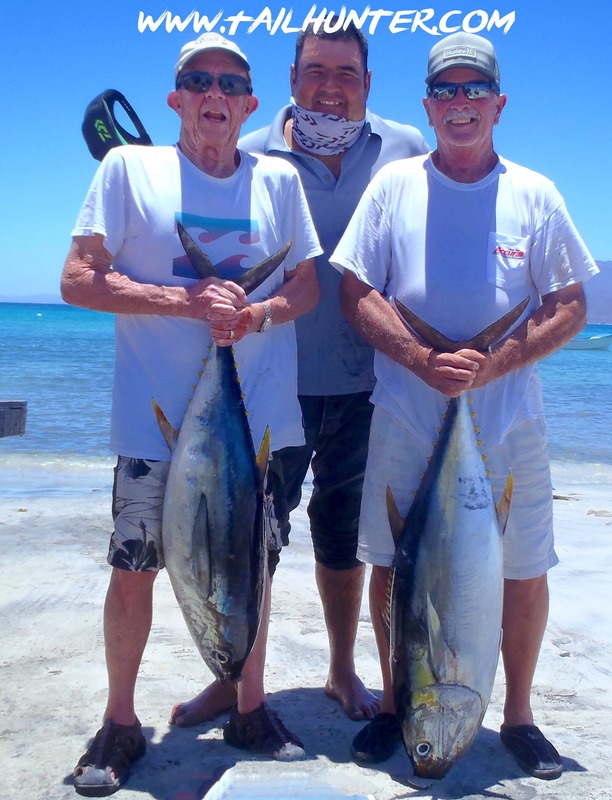 This is Matt Bigalk with a couple of nice yellowfin tuna. Matt is from Colorado. 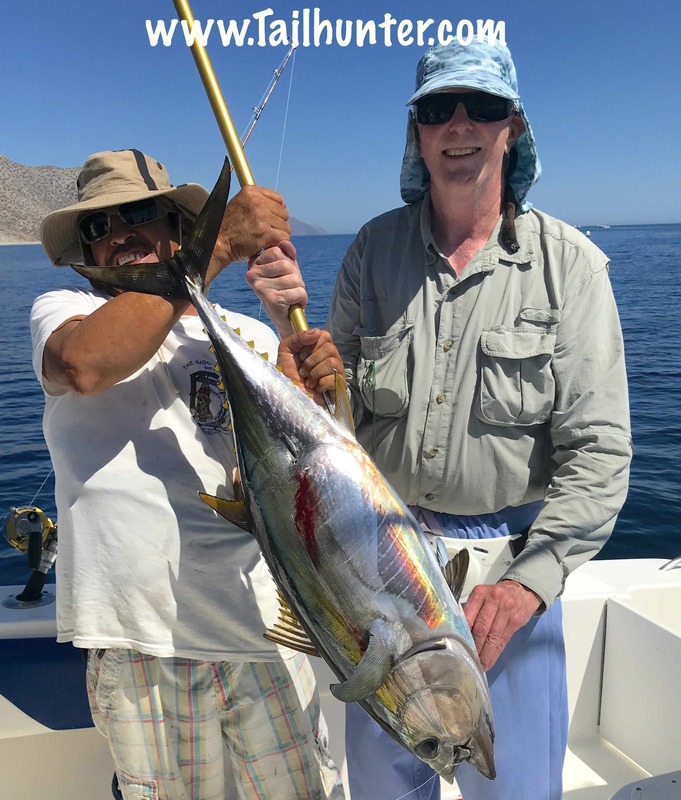 Our buddy, Gary Wagner, owner of Rancho Costa and the famous Giggling Marlin Bar in Cabo with one of several amberjack caught this week. Marc Garrison from Chicago with another YFT! Just south of Cerralvo Island on the high spot. 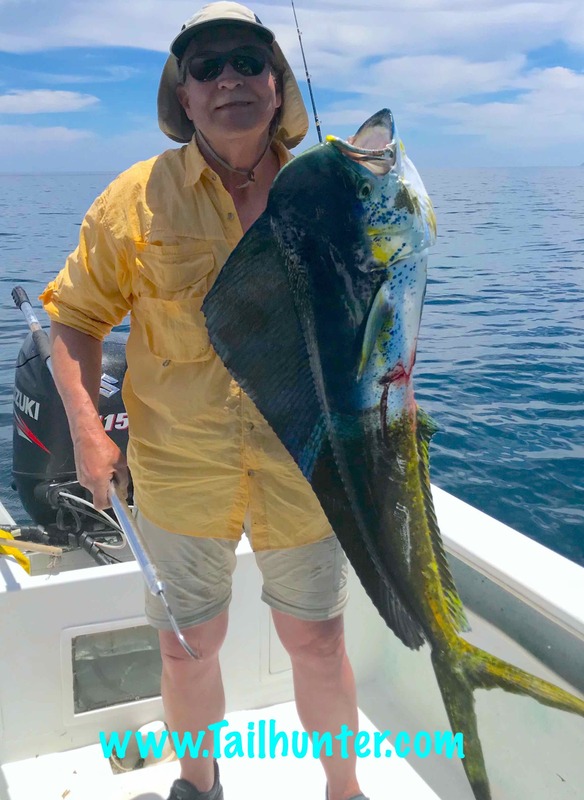 It’s easier said than done to pose with a fresh powerful dorado and take a good photo when you’re tired and the fish is trying to whack you in the shins! But, Mike Lohrey poses with one of the larger dorado of the week! 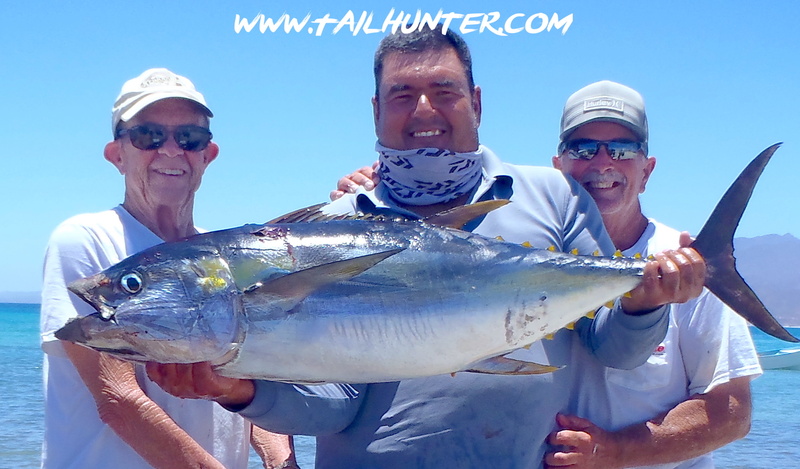 These big bonito kept everyone busy when not much else was happening and believe me, they tore up some of our anglers. Mauricio Villanueva poses with a pig boney! Thanks for the photo, Gary Wagner! 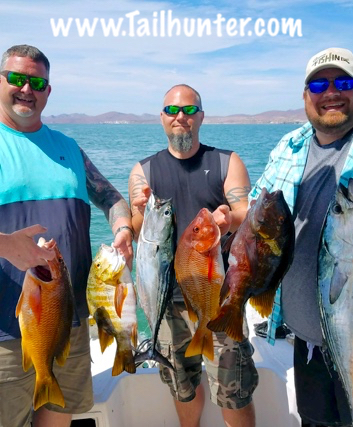 Washington boys on deck with Jason Robbins, Brian Izzi and Dave Wentworth and quite a variety of fish taken with our Tailhunter La Paz fleet! 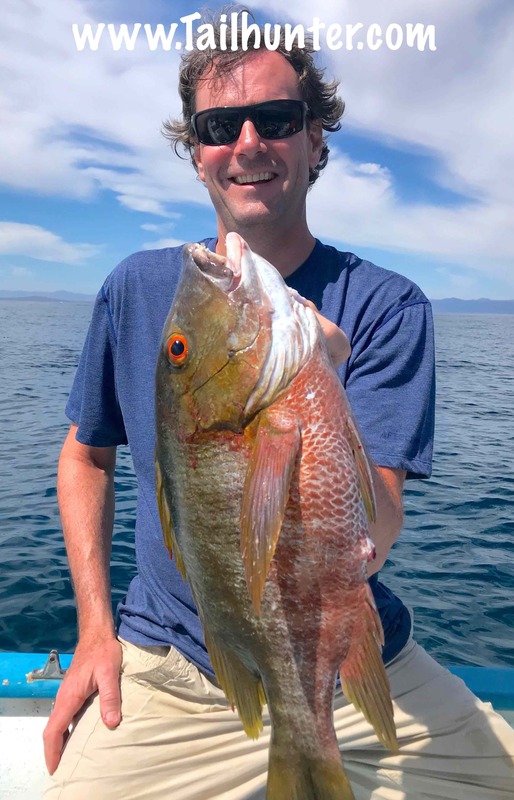 Barred pargo / pargo mulatto for Craig Hoffman just off Punta Perrico. Marc has another one for the fish box. This time it’s a great eating pargo. First amberjack showing of the season. This is Dr. Roy Stringfellow showing off his fish while staying at Rancho Costa there at Muertos Bay. This is what guys from rainy Washington do when they come down here. Parting shot from Jason Robbins getting some sunshine. The week started with a lot of promise. The end of last week, it seemed like the fish were ready to go even with a full moon and windy conditions. However, that’s what you get when you start guessing on Mother Nature. The week started out pretty scratchy. We had to work hard to find and get fish. It wasn’t for lack of trying by the anglers or captains. It’s just the way it was. Big waves and winds didn’t help. We did have some action, don’t get me wrong. 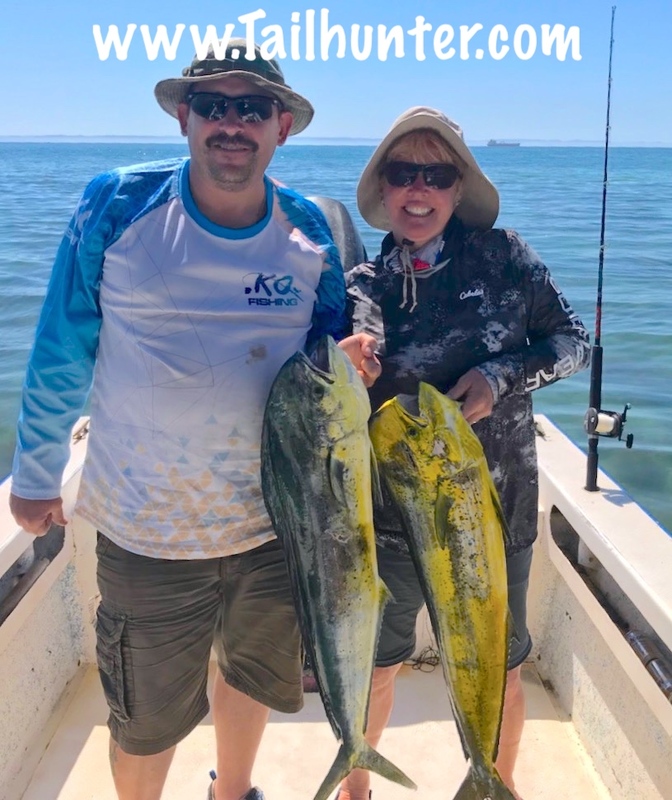 Thankfully, pargo, cabrilla, jack crevalle and big bonito kept rods bent when nothing else was happening but there just wasn’t any quality to the fish…nothing really to put in the ice chest or bring back to the restaurant! Then…right at the end of the week, we recovered in the 9th inning! Tuna and dorado saved our bacon! 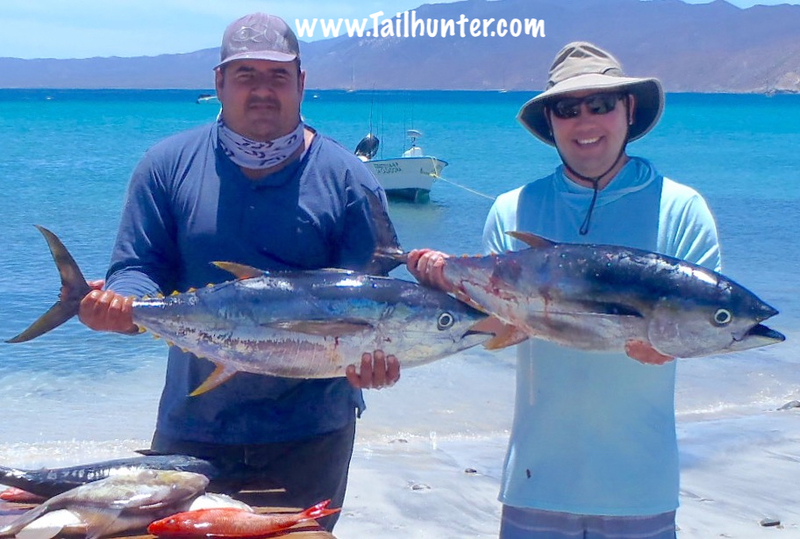 Some slugger 15-30 pound yellowfin tuna showed up for our Tailhunter Las Arenas/ Muertos Bay fishers. 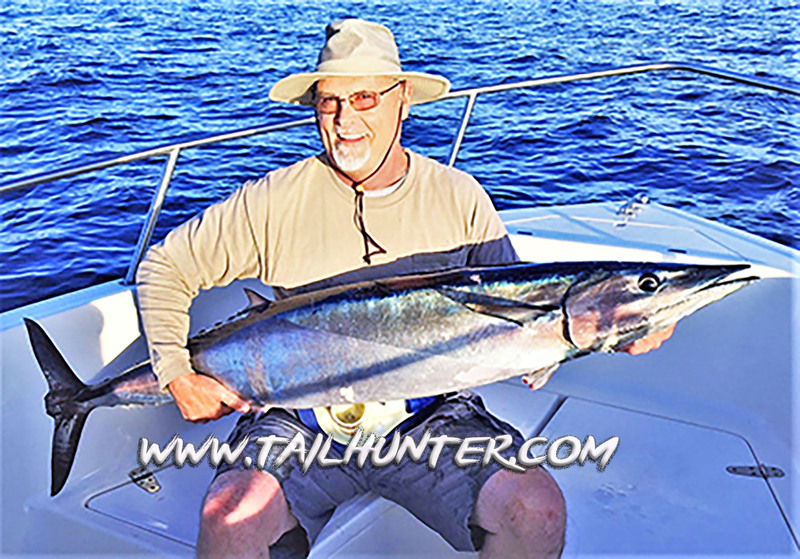 For many, their first experience on yellowfin and we lost some fish after some rough battles. Actually, we had the best tuna bite of the season with the kind of tuna we don’t usually see until later in the year! Also, we got wahoo bit and we also got our first marlin as well plus amberjack and a big dog-tooth snapper out’ve the rocks. The biggest thing was finding bait and waiting for winds to abate. Tough time for many of our flyfishers. They went to conventional gear and still had fun. Our Tailhunter La Paz Fleet fared a bit bitter. Good action in the rocks for snapper, pargo, big cabrilla and lots of big triggerfish plus a smattering of dorado and lots of huge bonito. 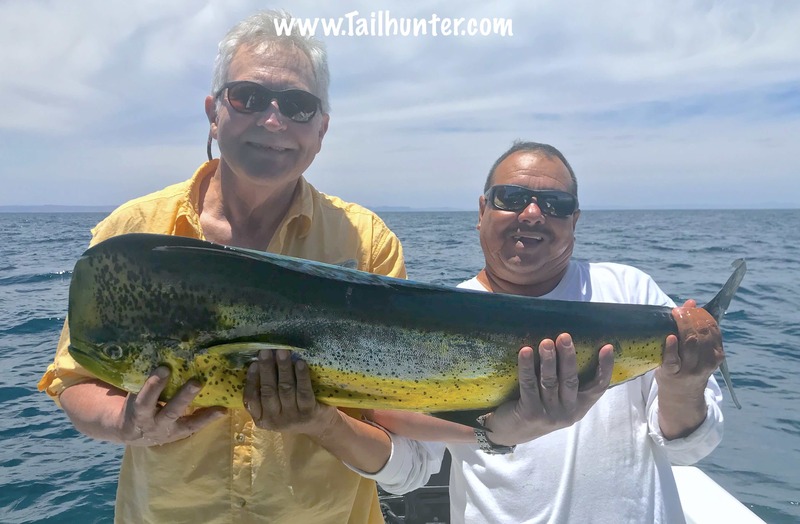 Then, like our Las Arenas fleet…the end of the week capped it off nicely when bigger dorado in the 10-30 pound class showed up and decided to chew! 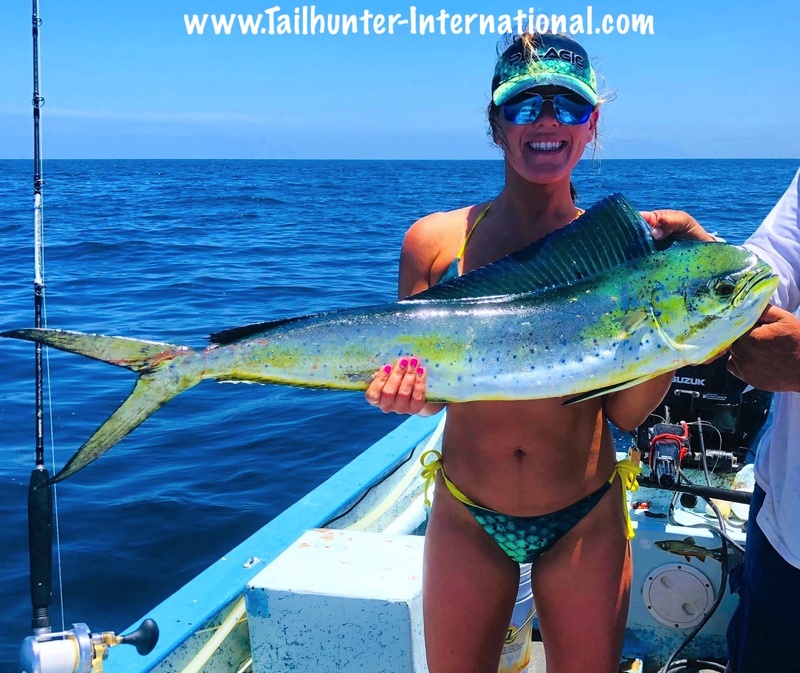 Way fun, especially for a lot of our first-timers to see these big mahi charging through the water and hit the baits! 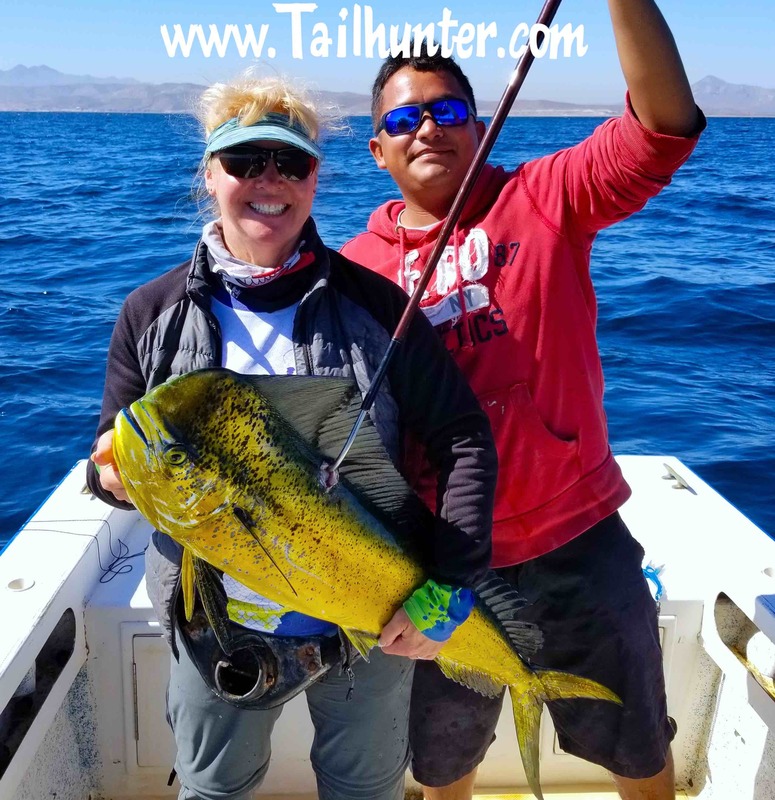 Just like the tuna… These are the size and type of dorado we normally don’t see until the fall and we have not seen this grade of fish in 2 seasons! We saw schools of boiling tuna, but all moving too fast to jump on them. Hopefully, things will continue to improve!